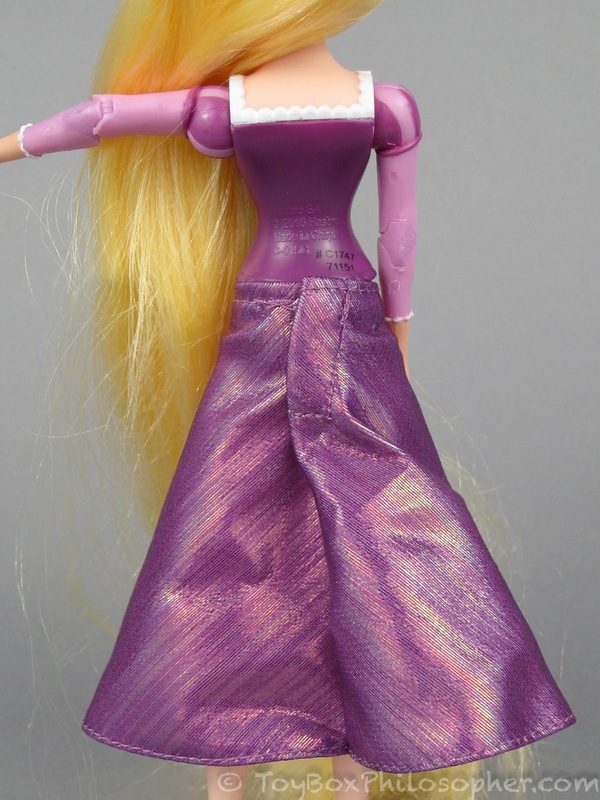 Over the years, I've chronicled my increasing frustration with the Disney Store and its Classic Princess dolls. My problem with the company centers primarily around their inability to design functional and durable knee joints. 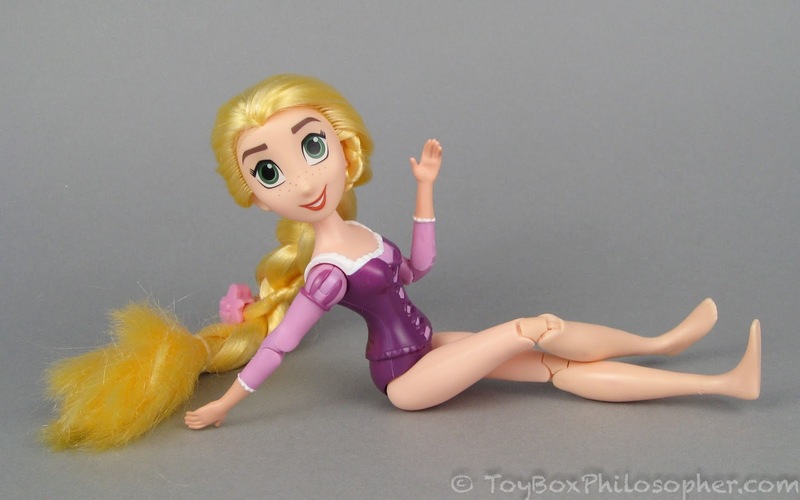 That was not a huge deal back when the dolls cost $13, but now that the prices have crept up and the limbs have gotten more fragile...I think it's a big deal. In fact, I was so exasperated with this trend that I decided to stop reviewing Disney Store dolls altogether. But--as many of you know--I made an exception to that rule when the live action Belle doll was released last spring. 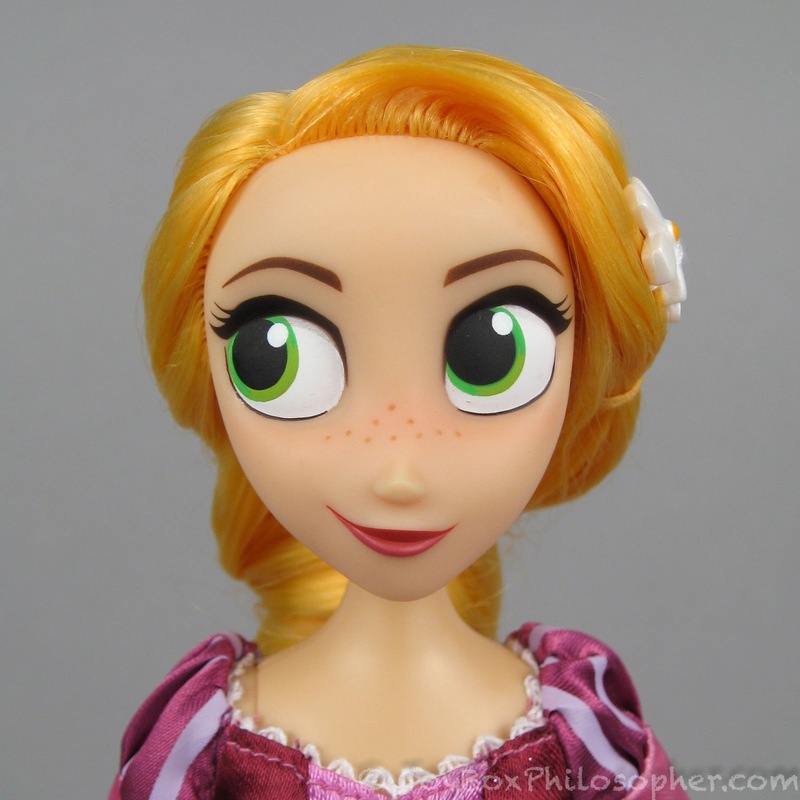 My love for the Belle character inspired me to try and take a fresh-eyed look at the doll. Sadly, even when I ignored Belle's predictably bad knees, she still disappointed me in other ways. I figured that review would surely mark my last Disney Store purchase. Wrong again! 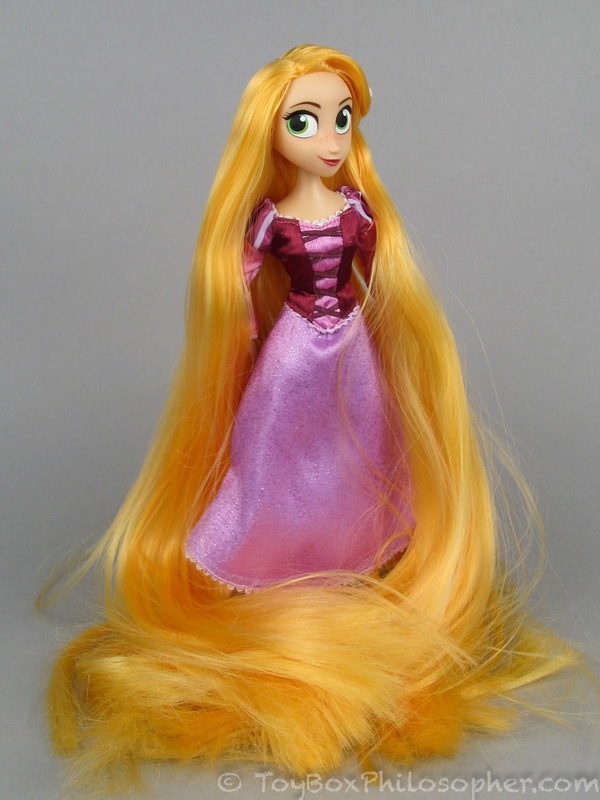 The Disney Store's Rapunzel from Tangled: The Series, $19.95. Before I launch into the review, though, I have a few comments about what I learned over at the Disney Store site when I was purchasing this doll. 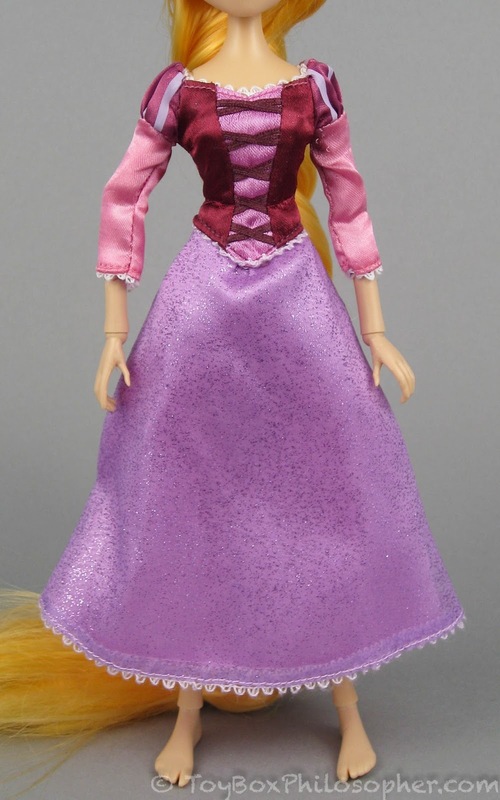 First of all, the live action Belle doll is on sale for $14.99. That's less than half what she originally cost. 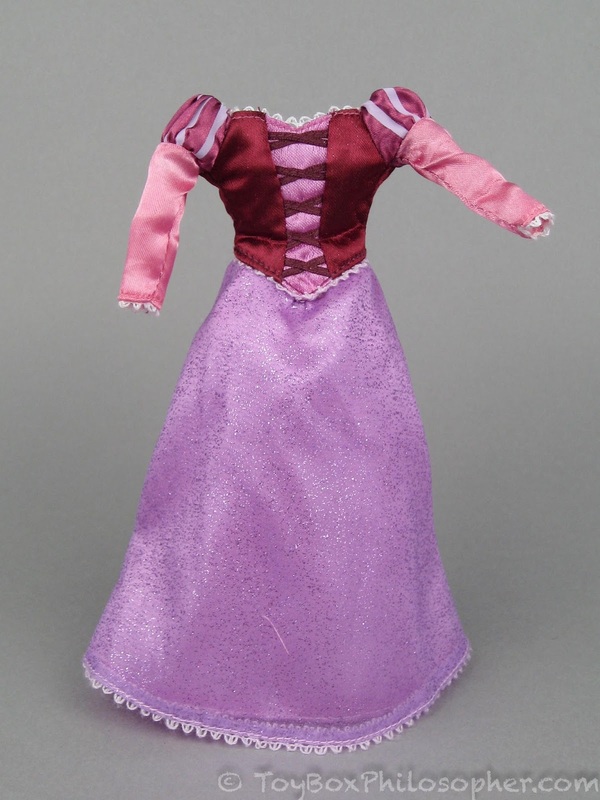 She might actually be worth the sale price, if only for her dress. Second, a customer review of the 2017 Classic Rapunzel doll suggests that her legs don't bend at all. 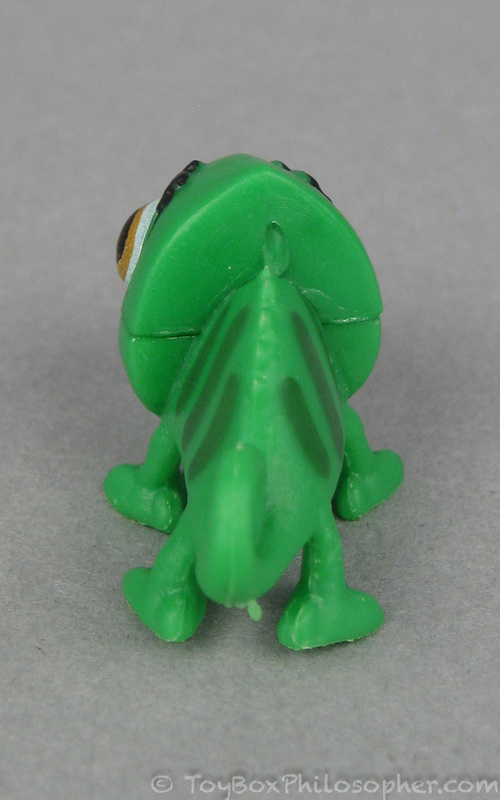 Other reviewers talk about flat-footed rubbery legs. I happen to be in New York this week, so I stopped in to the Disney Store to do some research myself. 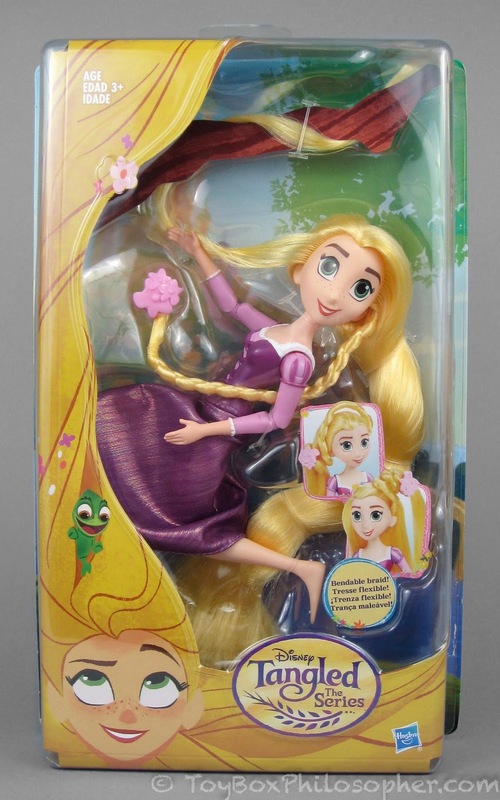 I didn't want to buy any of these dolls, though, so I cant be 100% sure about the articulation. I found it very tempting. 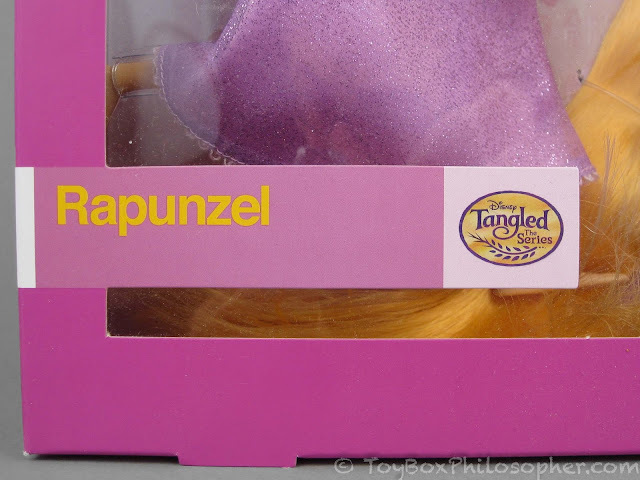 I love Rapunzel's dark purple cape and beaded hairstyle. 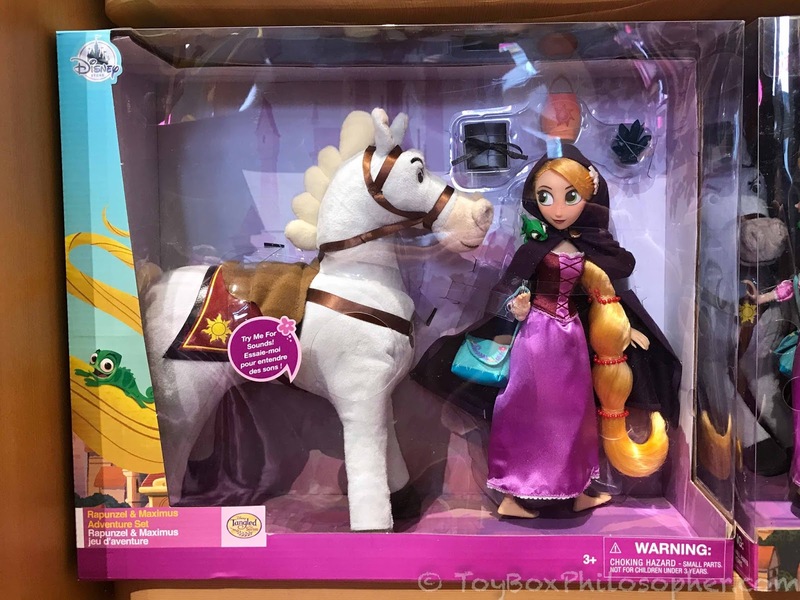 I also like Maximus...but would always prefer a highly-articulated plastic horse to go with a plastic doll. 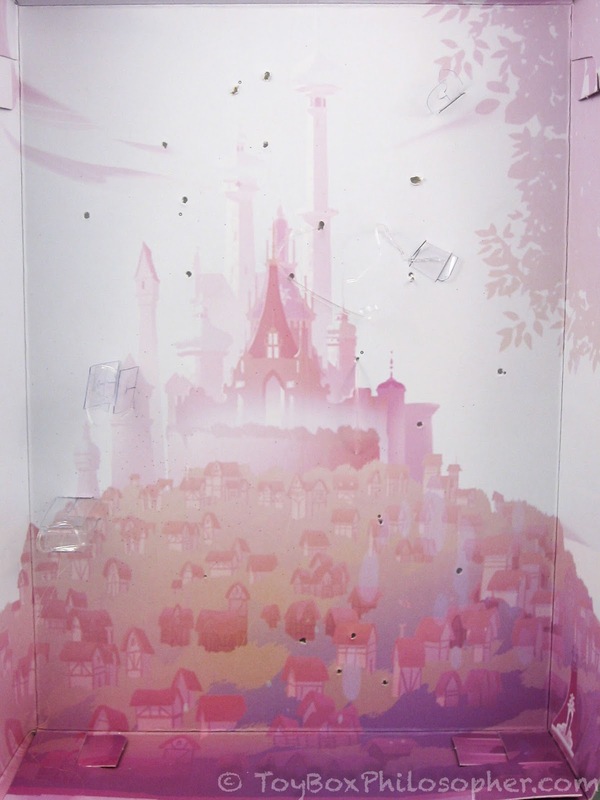 The set is quite expensive, too, at $45. Rapunzel herself is attached to a simple cardboard backdrop with no cut-outs or extraneous decorations. 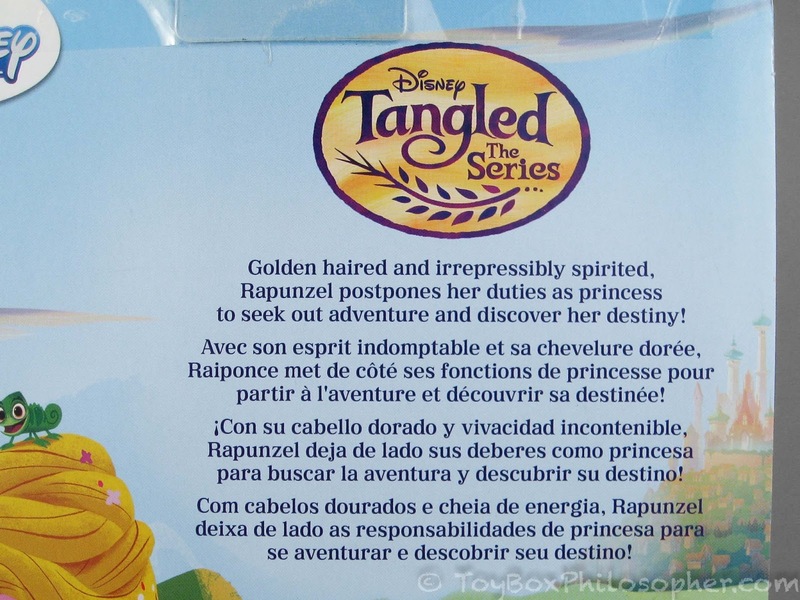 The packaging does not have any description of Tangled: The Series. 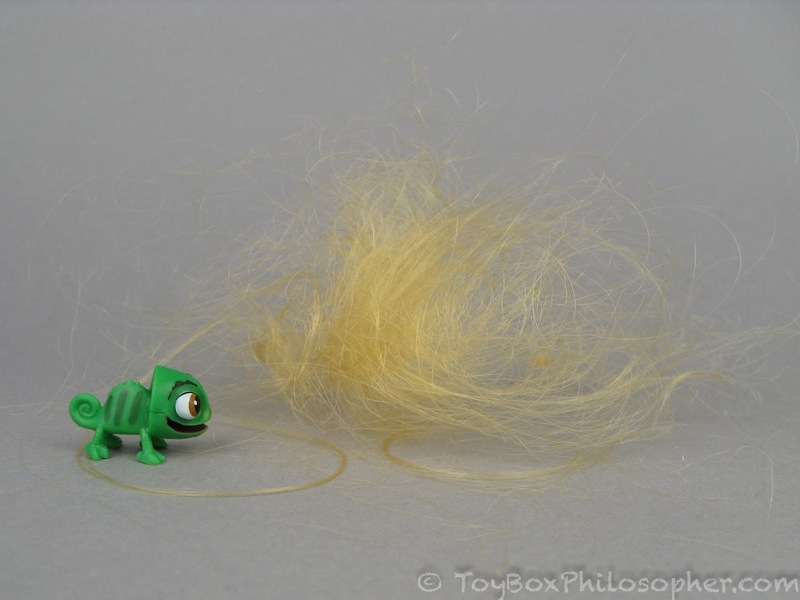 To learn more, I watched What the Hair?! (which I thought was the first episode) for free on YouTube. 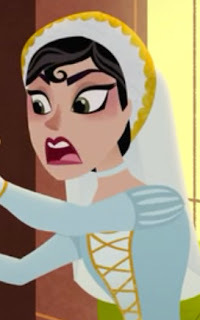 This was actually the second episode, which explains why I was confused throughout most of the story. After I found and watched the actual first episode (Tangled Before Ever After--a 55 minute mini-movie), I enjoyed the show a lot more. 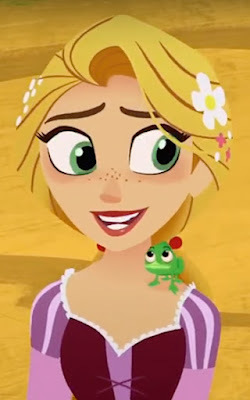 Many of the main characters are voiced by the same actors as the original Tangled movie (including Mandy Moore as Rapunzel and Zachary Levi as Eugene). 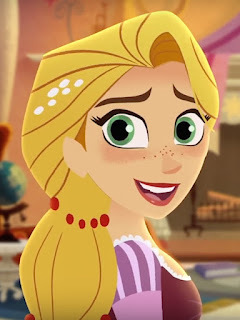 The plots are fun (and often funny) and chronicle the adventures of Rapunzel and Eugene during the time between Mother Gothel's demise and the royal wedding. 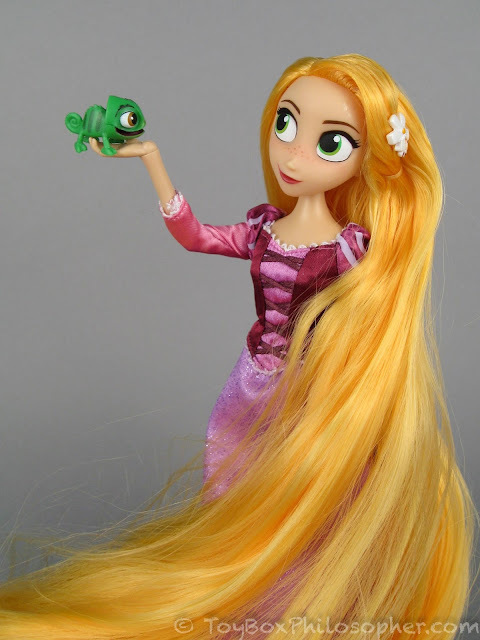 I think it was dangerous for Disney to mess with the beloved Tangled story, but they pulled it off pretty well. It's a nice show. 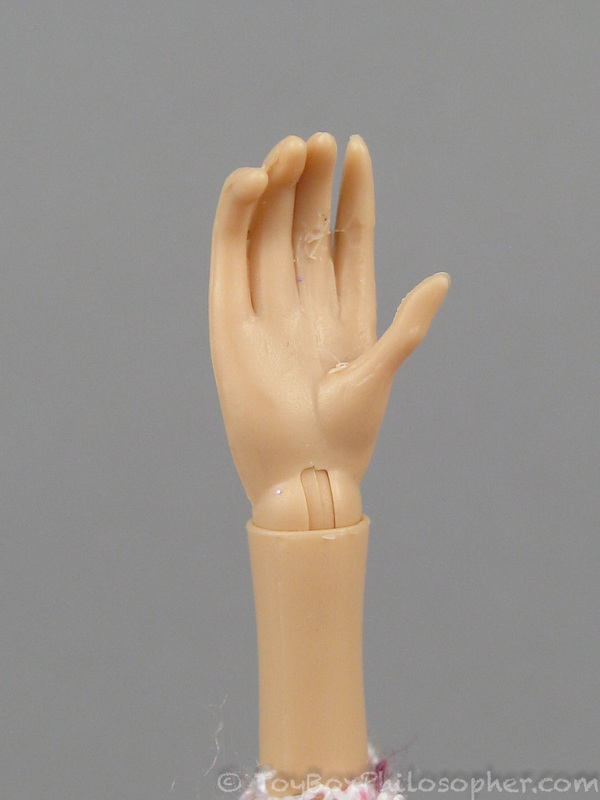 Is she left-handed? I never noticed this. 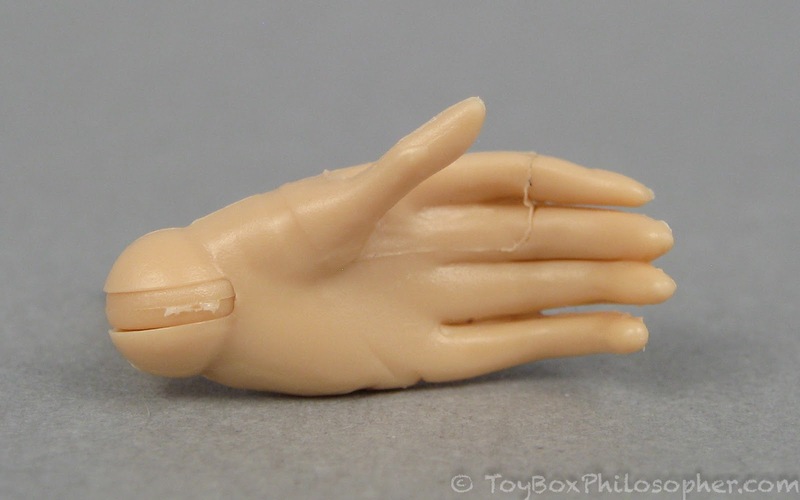 This doll does not have attractive hands. 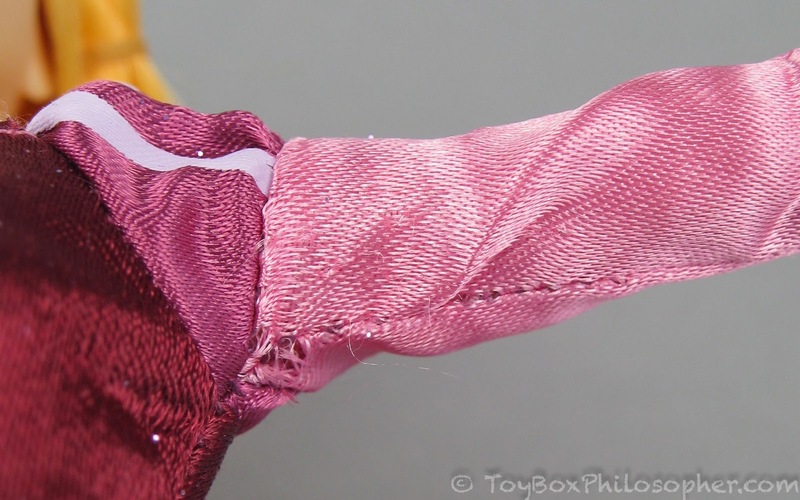 I've encountered similar stitching defects in Disney Store clothing before. It's not super-common though, at least in my experience. Just bad luck. His buggy, side-glancing eyes look funny from the front, but they look good from all other angles. But the precision on both sides is surprising for a figure of this scale. 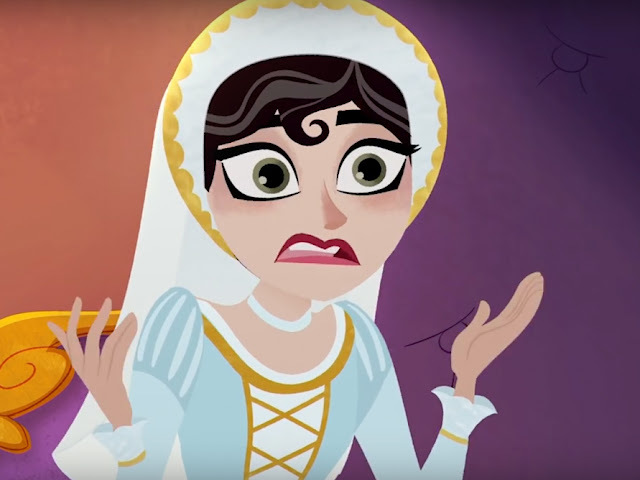 While I'm sharing screenshots, I have to ask: what is up with the Cassandra character? That's a devious face if I ever saw one. 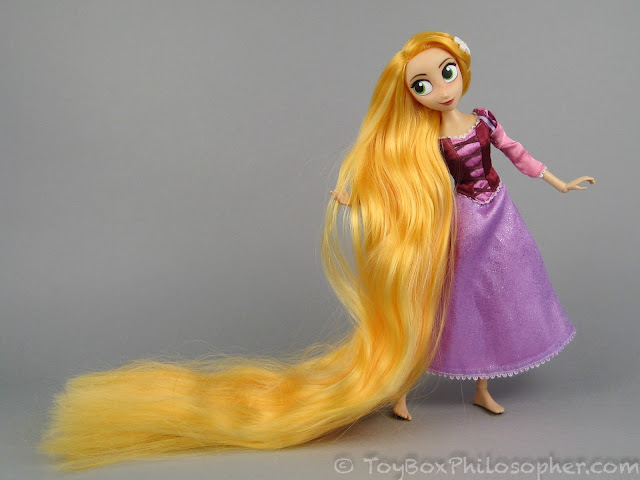 But let's get back to Rapunzel for now. 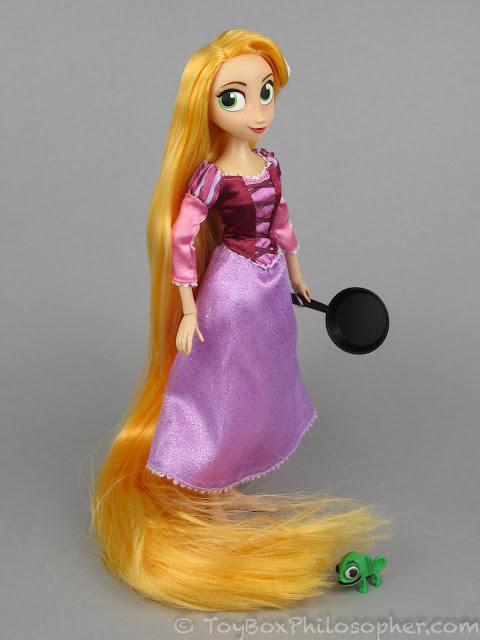 Rapunzel does not stand very well on her own. This is partly because of the substantial weight of her hair, but also because those knee joints buckle quite easily and are hard to position when the legs aren't visible. 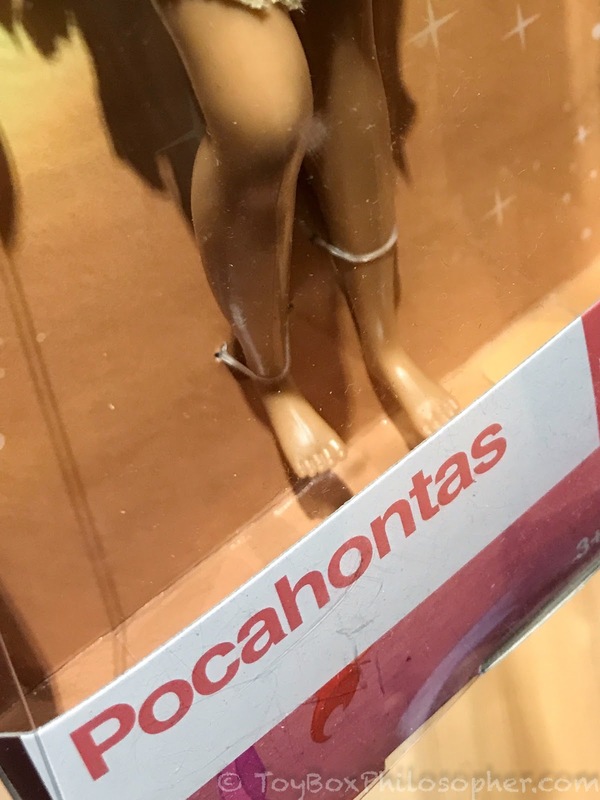 With those big feet, it seems like she should be more solid. The last Disney Store Rapunzel I reviewed was the Classic doll from 2013. 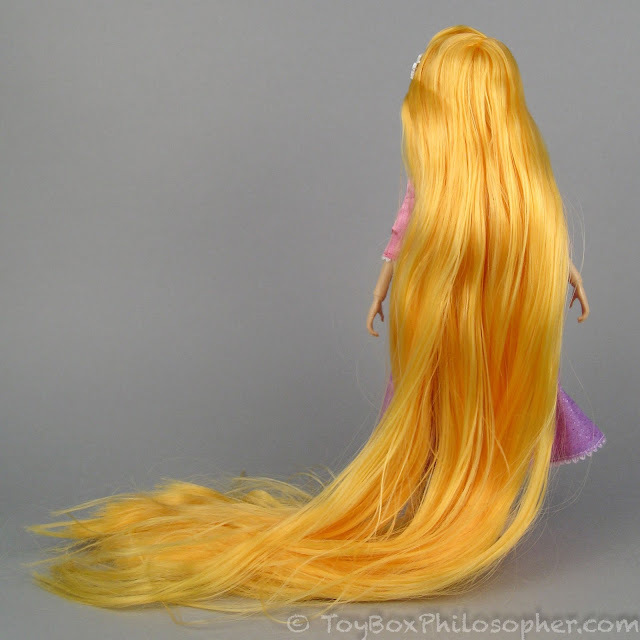 The new Rapunzel's hair is nowhere near as silky and smooth as the 2013 doll's hair. Now that all of the knots are gone, the hair is much easier to brush. It takes a while to brush it--don't get me wrong--but it's not an onerous task anymore. 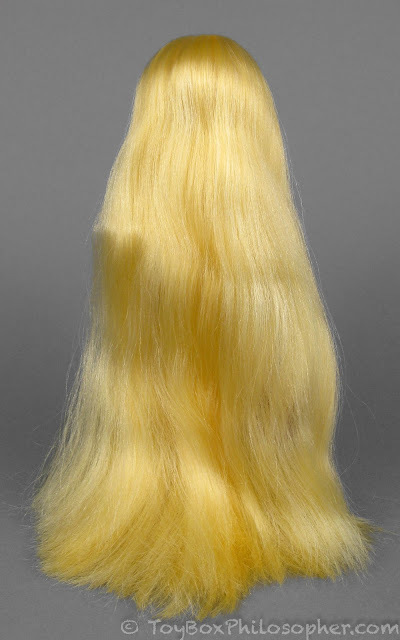 However, the ends are scraggly, and so even immediately after a thorough brushing, the bottom section of hair instantly looks messy again. The hair looks nice from the top, though, and the sheer quantity of hair gives this doll a very authentic Rapunzel quality. 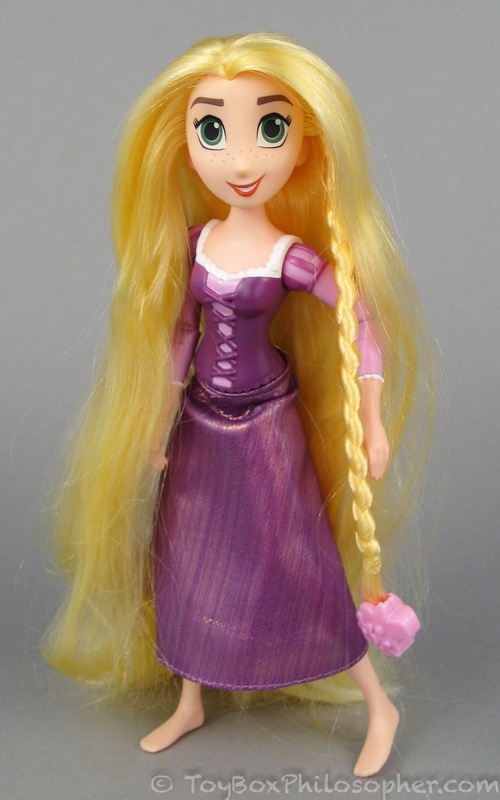 There is absolutely no way that this doll could survive a child's game for more than about ten minutes without the hair tangling up again. I feel pretty confident about this statement because of how often the hair tangled up on me while I was simply staging pictures. It gets harder to balance Rapunzel when the weight of her hair is concentrated at the back of her head like this. 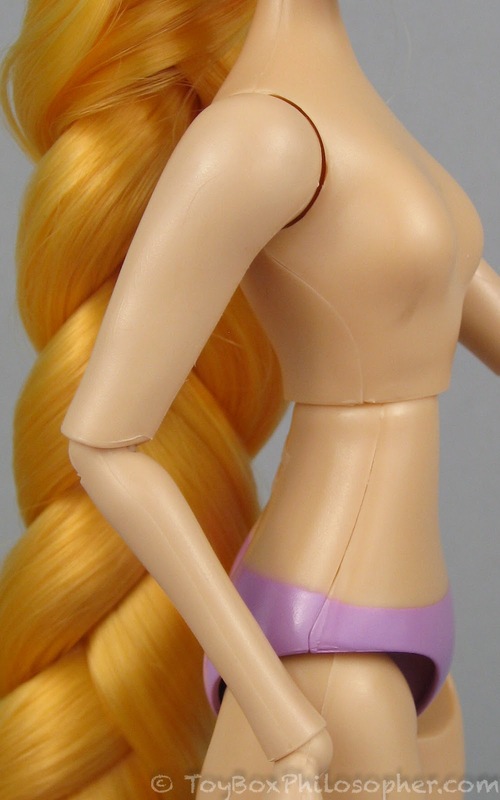 On the plus side, though, it's easier to feel and manipulate the knee joints when the hair is out of the way. 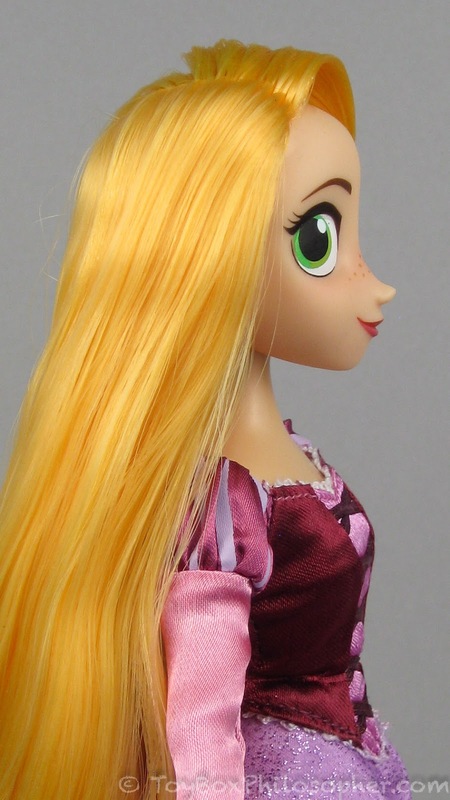 It's a little easier to see her facial features when the hair is out of the way. I love side-glancing eyes, but these eyes look mismatched to me. 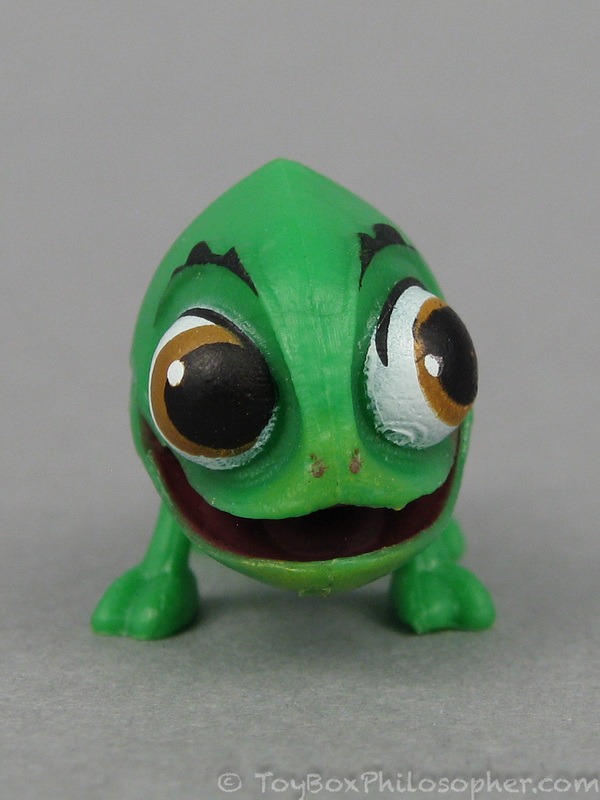 Doesn't the left pupil look bigger? 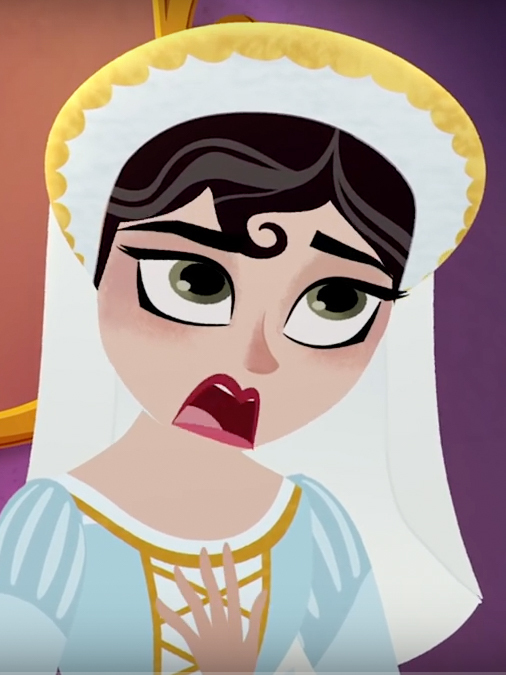 Rapulzel's eyes are both looking in the same direction, which is nice. She can glance impishly up at the camera with no problem. 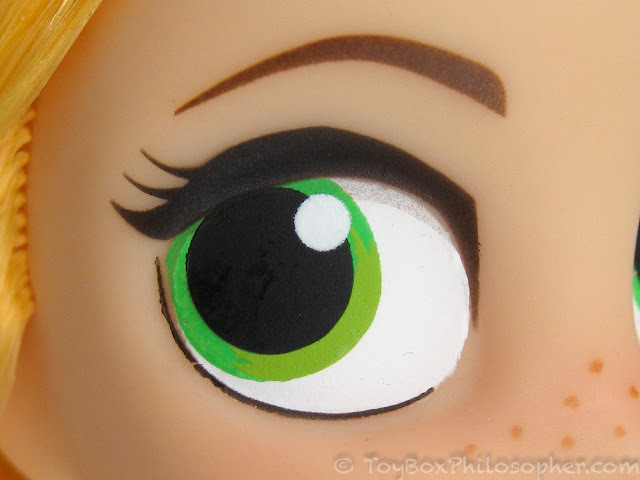 The paint is nice and crisp, with only a few small errors (like the green of the iris spilling over onto the outside edge of the eye). 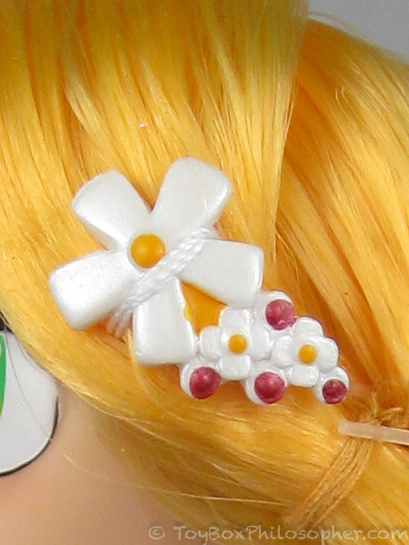 I like the two-toned detail of the narrow iris. The inside edge of the eye is not as crisp on this side. 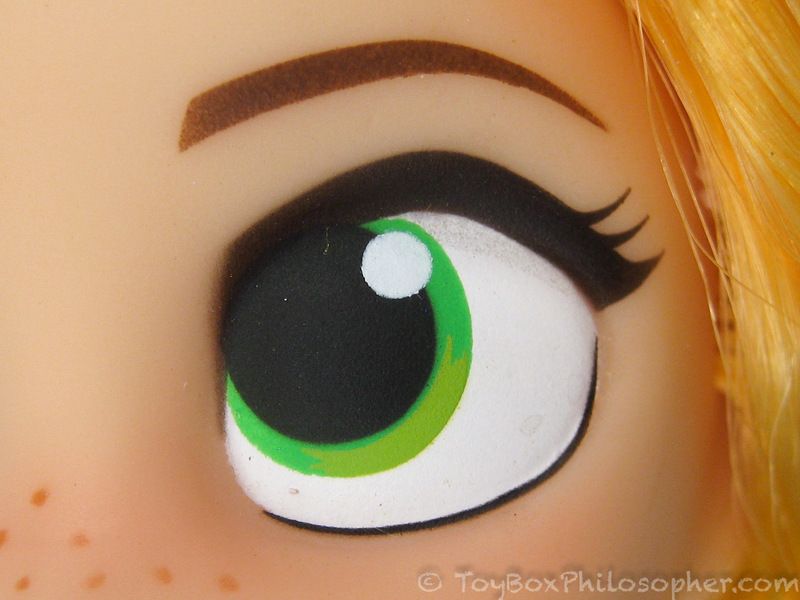 Also, the pupil intersects with the dark band of eyelashes on that inner side. I wonder if the merged areas of black are what make the pupil seem bigger? It might just be bigger. As much as the Disney Store might be neglecting the articulation on their dolls, they do a really wonderful job with the face molds and face paint. 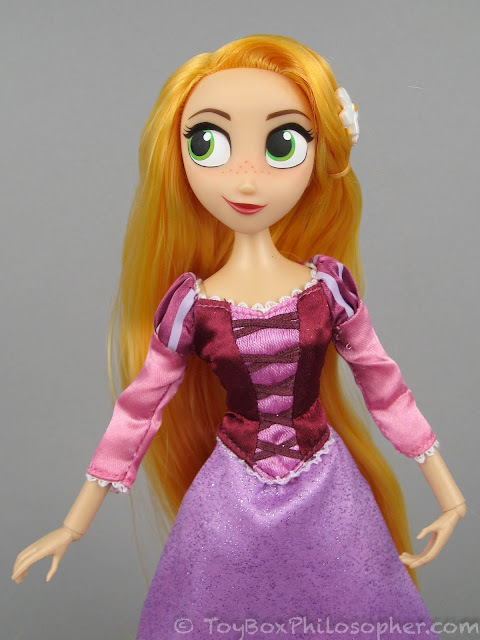 Not only is this Rapunzel cute and expressive, but many of the new 2017 dolls have lovely, bright faces. 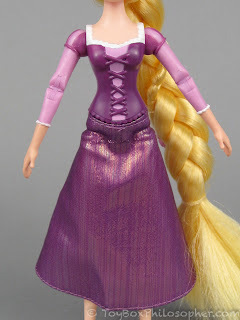 The dress is a fairly typical piece of Disney Store doll clothing. 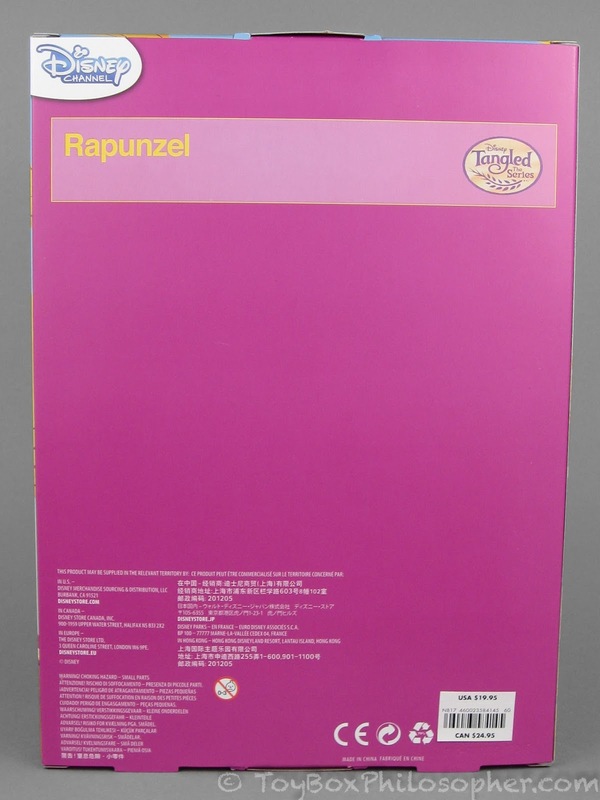 It's easy to use, colorful, and has lots of great details that are accurate to the character. There's a small amount of glitter shedding from the skirt, but it's barely noticeable. The construction of the dress is fine, aside from the splitting sleeve seams and a few snags in the shiny fabrics. But this next part is what we've all been waiting for, right? The new body! 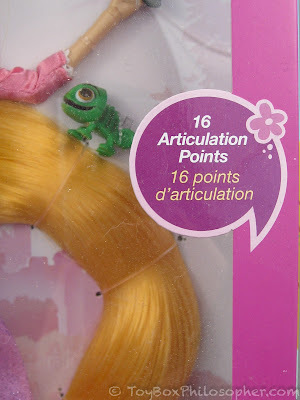 Rapunzel does, indeed, have sixteen points of articulation...if you count the double joints in her knees! But let's start from the top and work our way down in the normal way. Her wrists have excellent movement...but those hands still look claw-like to me. A small tweak in the shape of the elbow joint would make a huge difference in flexibility here. 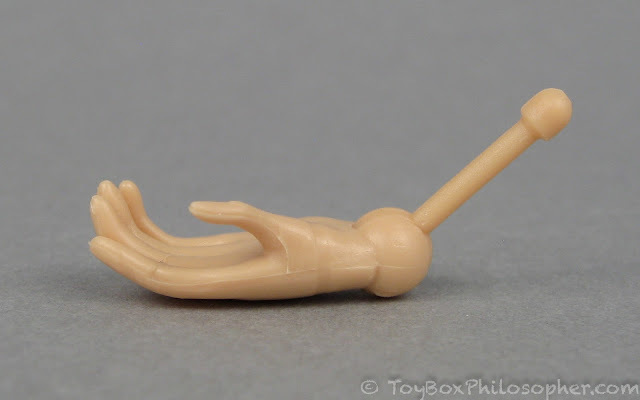 Best of all, the torso joint can twist! 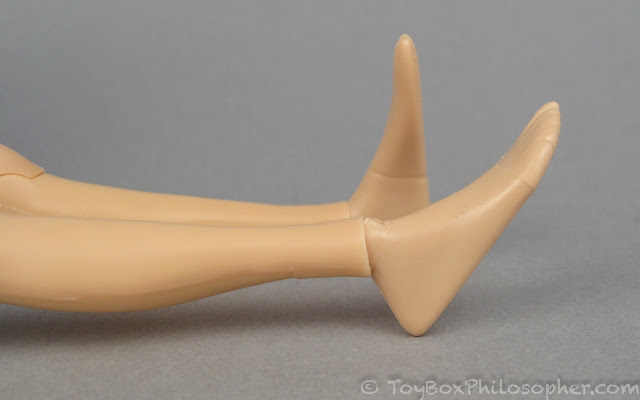 This movement gives her legs different functional lengths. When the dress was hiding her body, I couldn't tell when the hips were misaligned like this. I've showed you the double-jointed knees already, but I'll show you a little more of what they can do. 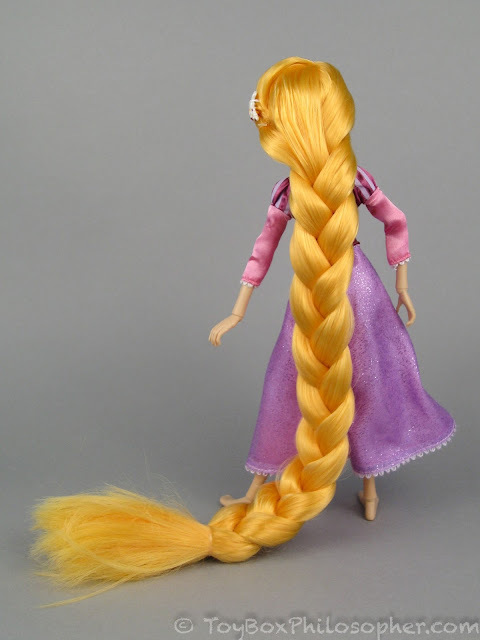 Rapunzel does have flexion and rotation in her ankles, which helps a little. I wonder if some of the seam lines on the bottoms of Rapunzel's feet contribute to her difficulty in balancing on her own? It might be worth my while to try and sand those down a bit. 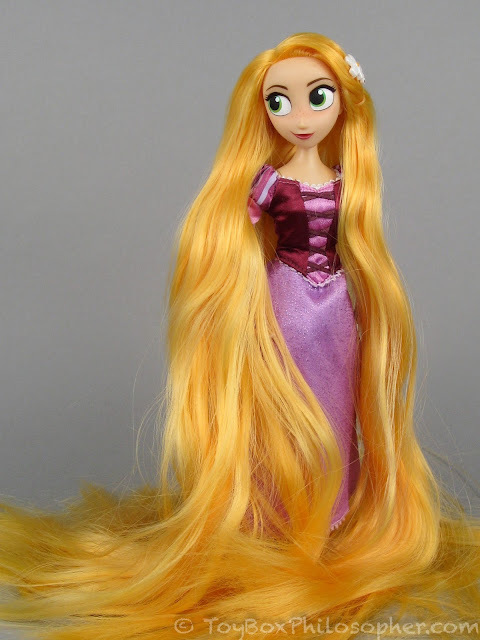 In fact, I had the most fun with Rapunzel when she was undressed, and when her hair was loose--acting almost like another appendage. This doll isn't even designed to look like the character in the original Tangled movie, but I feel like she exudes more of that Rapunzel's personality than any of the Classic Princess dolls ever have. 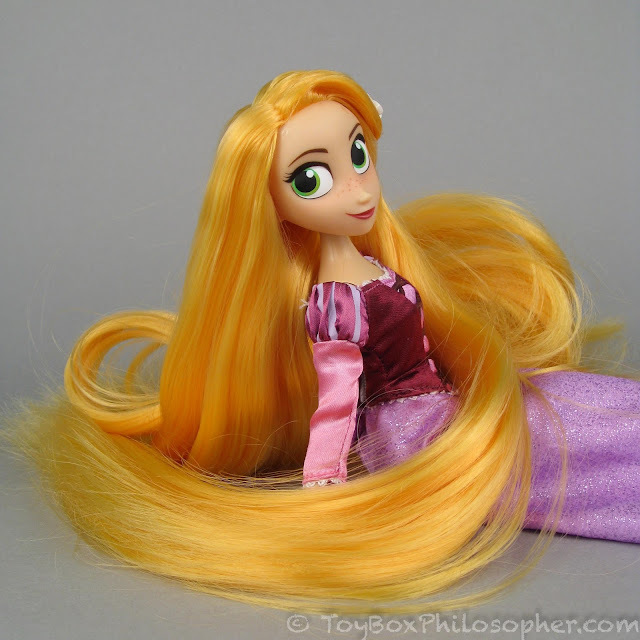 The copious hair might be impractical for play...but it's excellent for photography! Classic Rapunzel with Tangled: The Series Rapunzel. 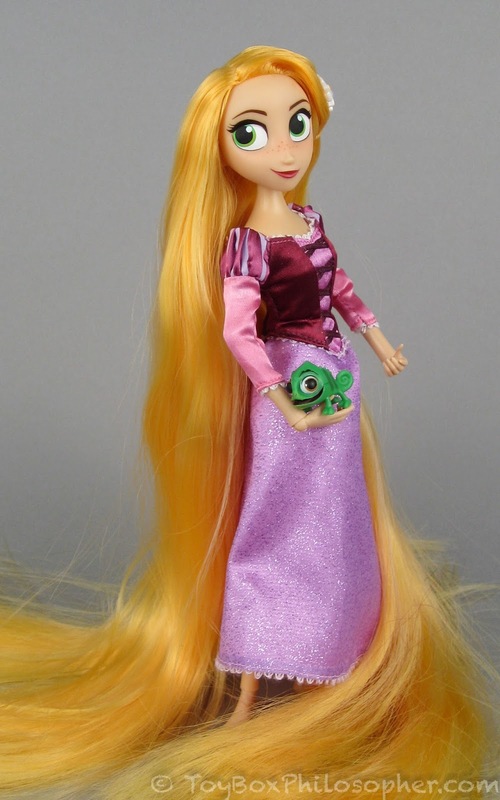 Disney Fairies doll with Tangled: The Series Rapunzel. 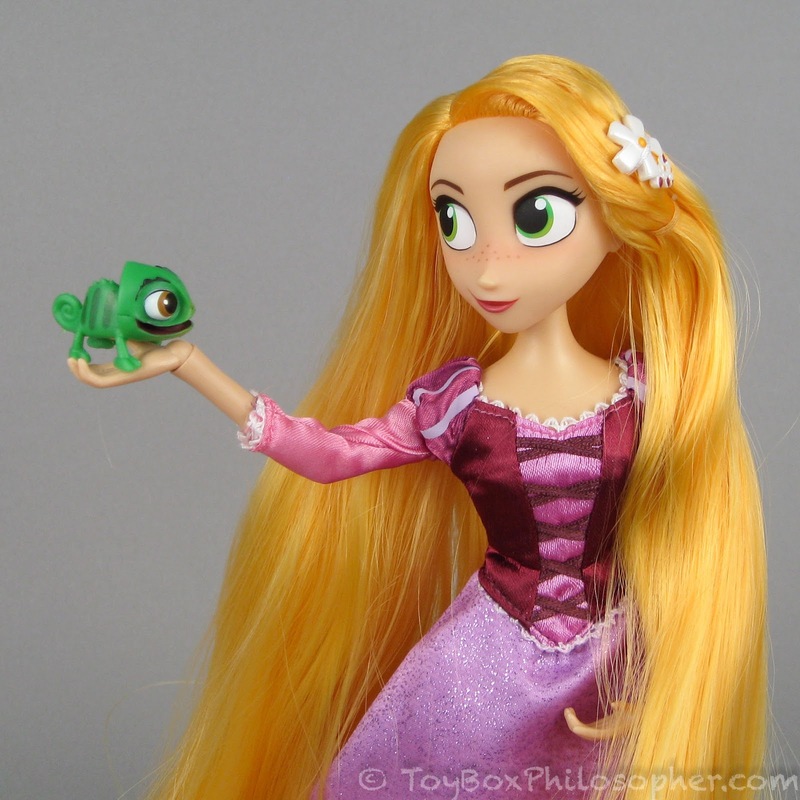 Classic Rapunzel (2013) and Tangled: The Series Rapunzel (2017). In addition to the height difference, these two have dramatically different hair. 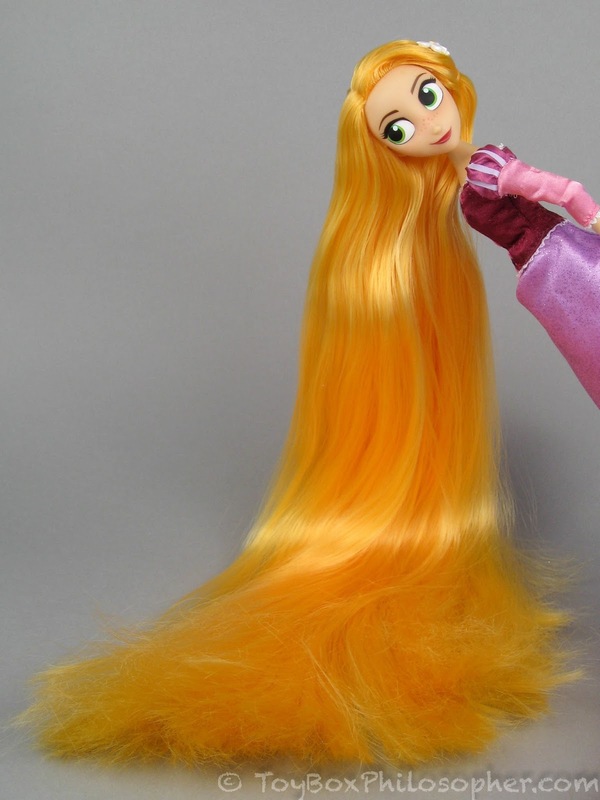 The new Rapunzel's yellow-orange hair is coarser, with more of a synthetic feel. 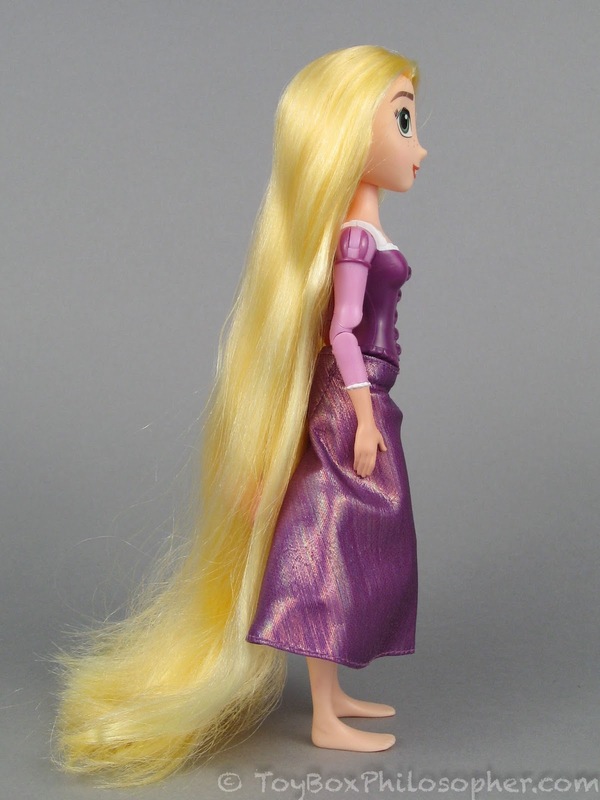 The older doll's wheat-blonde hair is silky and smooth and much less prone to immediate tangles. 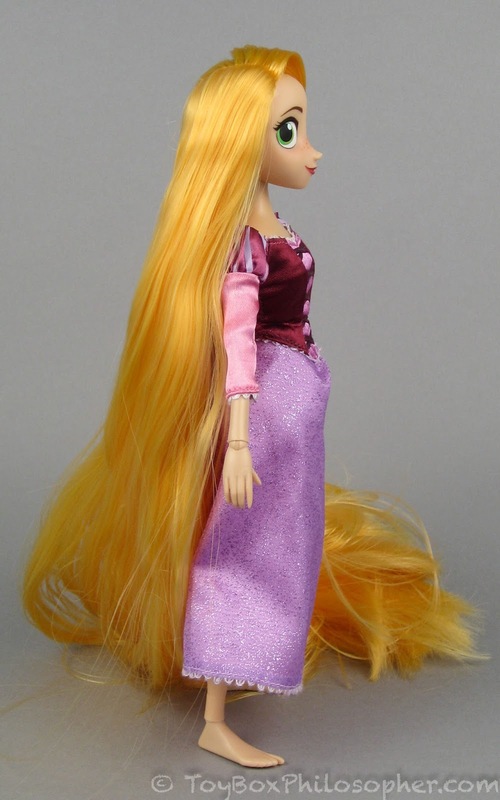 The extreme length and cartoon-like color make the new Rapunzel's hair unique and fun, but it doesn't have anywhere near the natural feel or glossy flow of the older doll's hair. 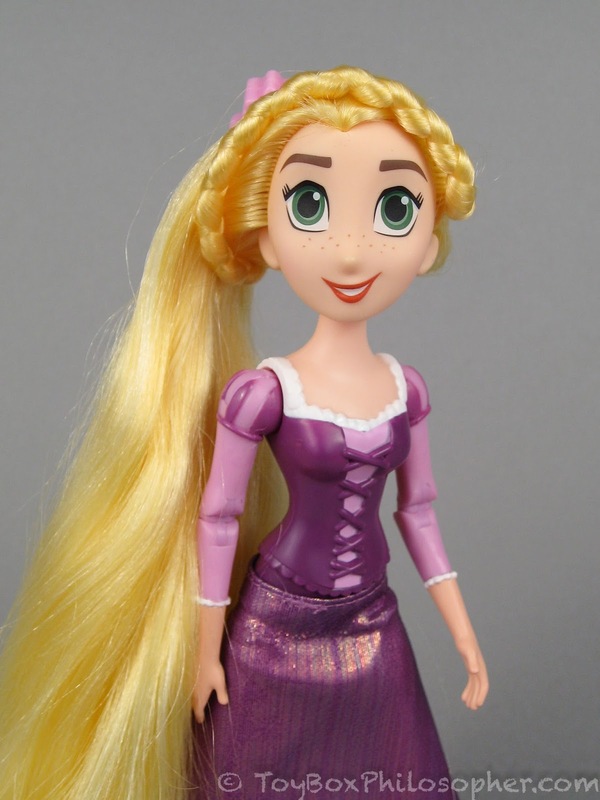 Hasbro's Tangled: The Series doll. This is Hasbro's version of the Rapunzel from Tangled: The Series. She costs around $11. 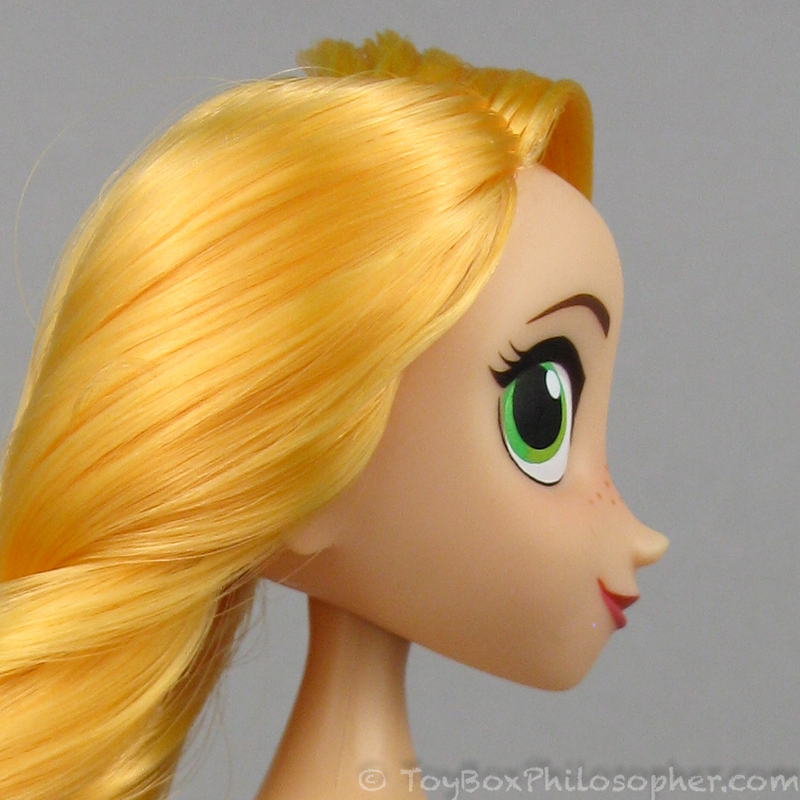 I decided that while I was unboxing this doll for a comparison shot, I might as well do a really fast review! 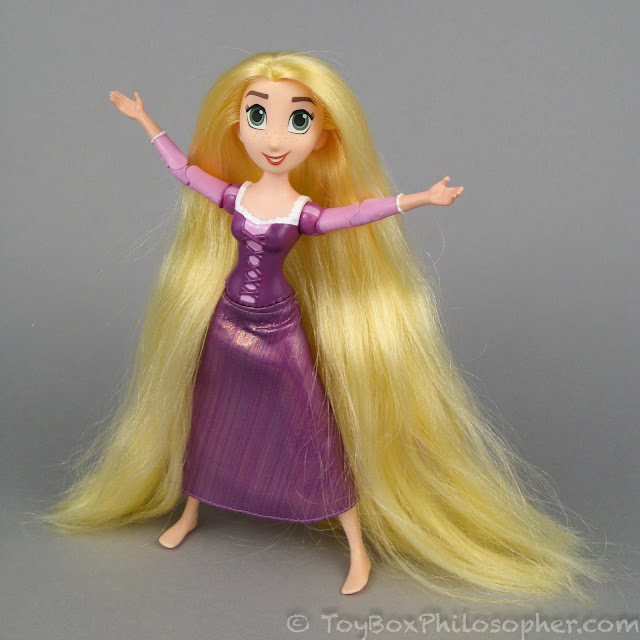 I manipulated her limbs and managed to get her to stand a little straighter. 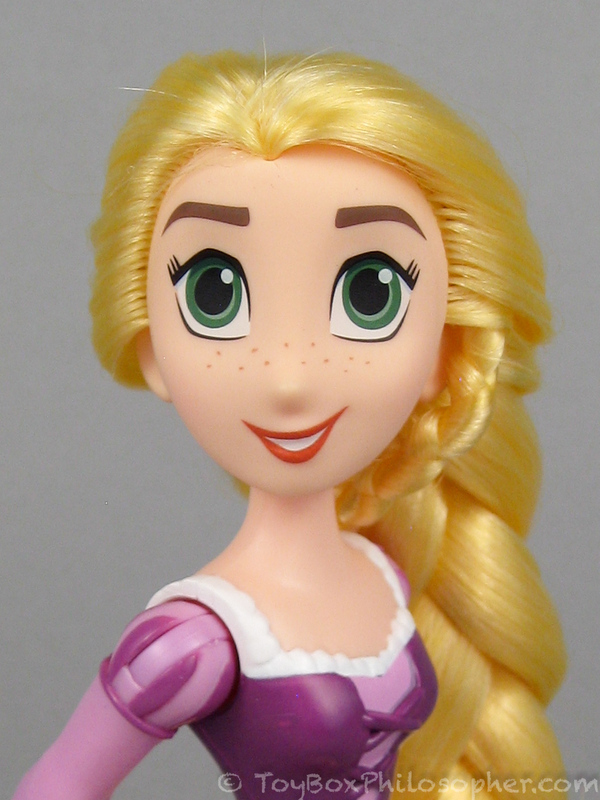 The problem is that when she's standing up straight, her eyes look way up to the ceiling! ...and much easier to manage than the Disney Store Rapunzel's hair. They're both drawing from different elements of the television show character, I guess. 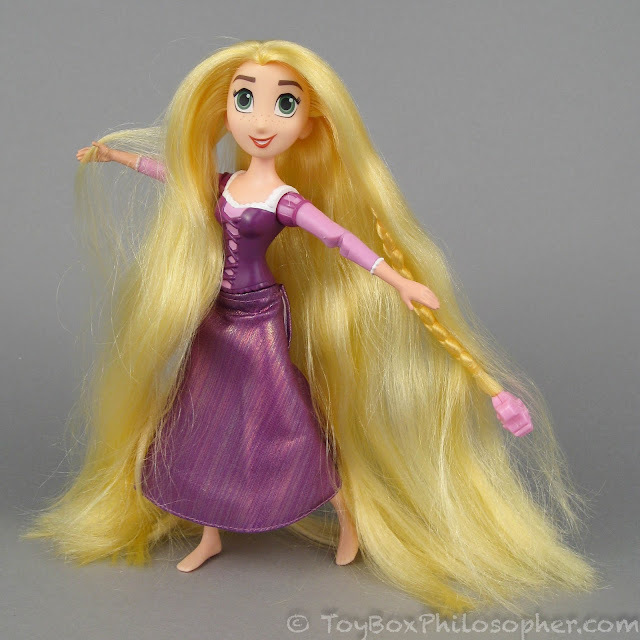 When I'm watching the animated Rapunzel speak and move, I'm reminded of the Hasbro doll. When I'm looking at still shots from the television show, I think more of the Disney Store doll. This is the same basic design idea as what we saw with Mattel's Enchantimals, but the Enchantimals do it better. 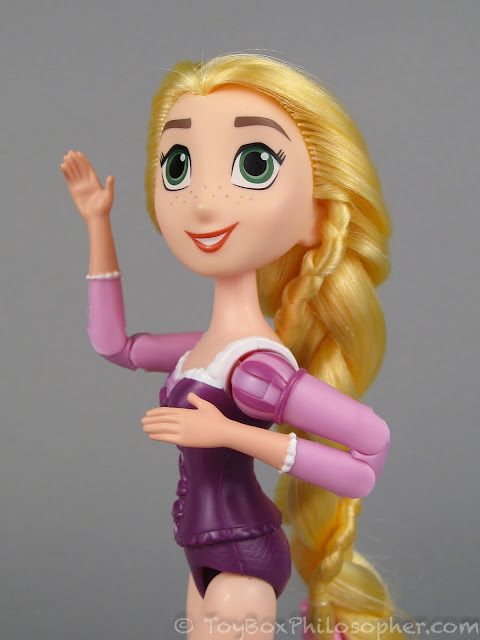 This makes many of her poses look robotic and stiff. But that's about all I could come up with. This is another cute doll from the Tangled: The Series show. Her face is quite different from the Disney Store doll's face. 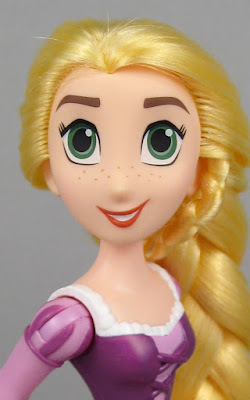 I feel like both are drawing from different elements of the television character's appearance, but I like the Disney face better. 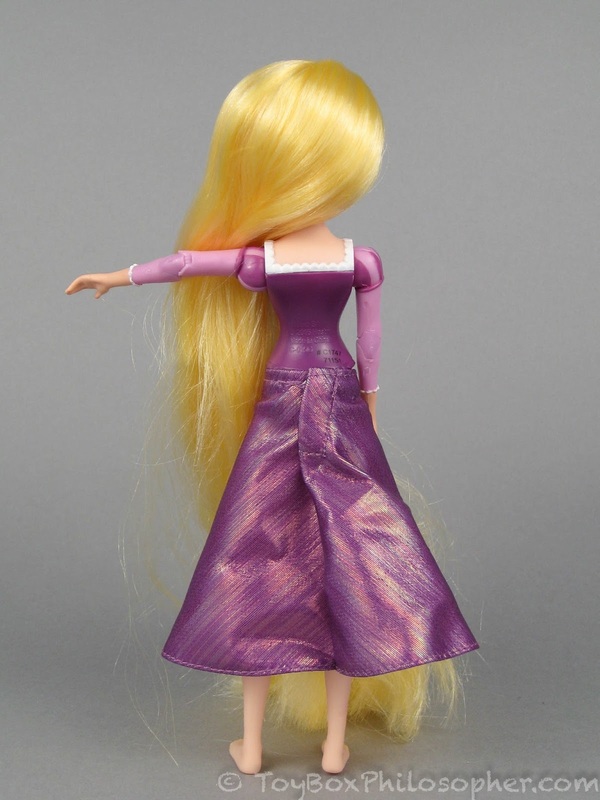 The Hasbro doll has molded clothing and a strange-looking skirt, but her hair and articulation are great. I bought her as an afterthought, but I enjoy her much more than I thought I would. 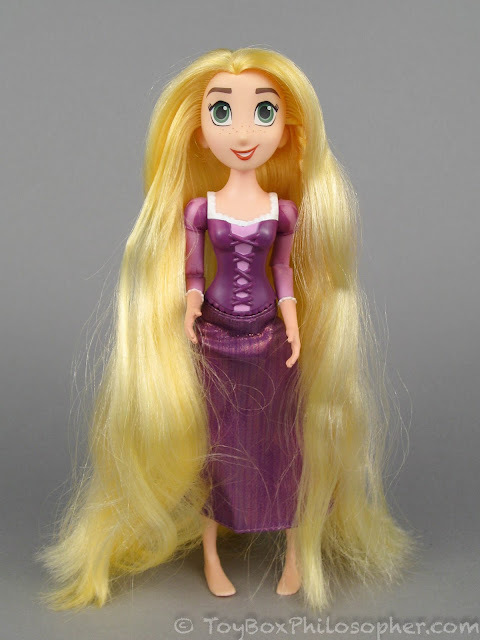 Overall, she's a lot easier to manage than the Disney Store doll. 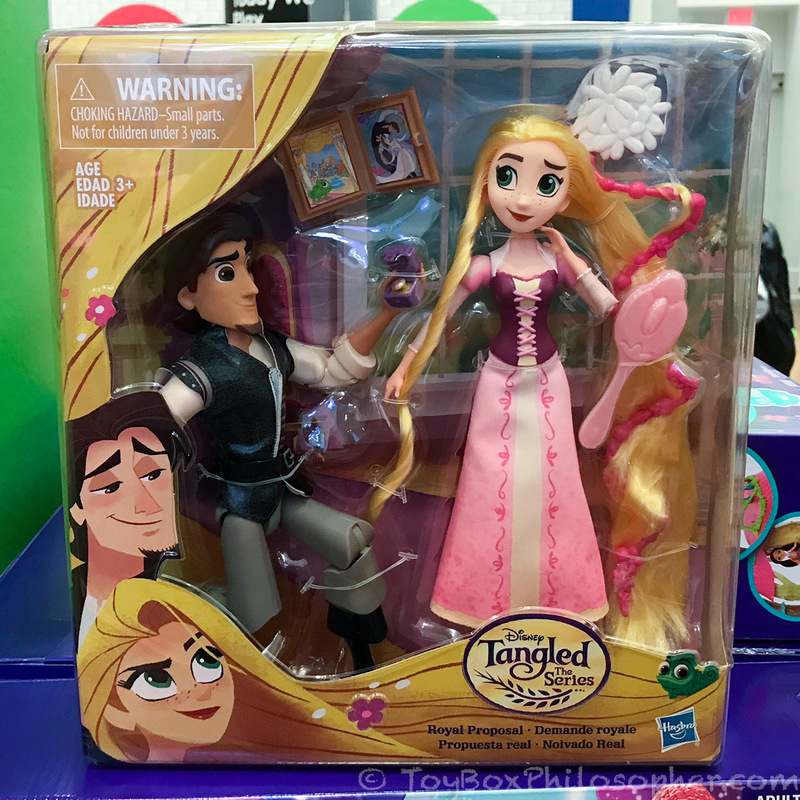 For anyone who's curious, I found Rapunzel and Flynn at the temporary Toys R Us store that's currently on the corner of Broadway and 42nd street. This new location opened in response to customer demand after the wonderful Times Square flagship store closed in 2015. The smaller store is only expected to remain in place through the holidays. First FAO Schwarz...now this. It's the end of an era. I though the Journey Girls had been discontinued. They're completely absent from my Toys R Us store in Maine. I almost bought one out of nostalgia, but resisted. 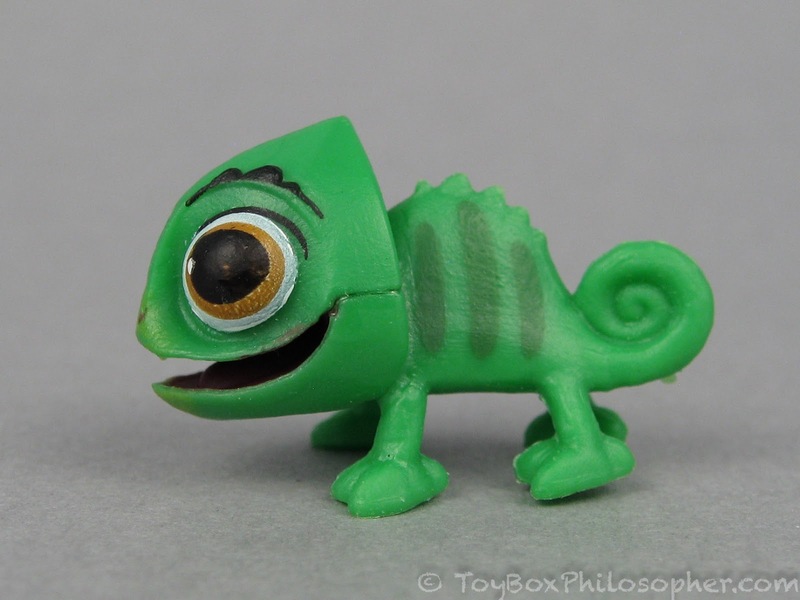 I now see that they're still available online, too. My mistake! 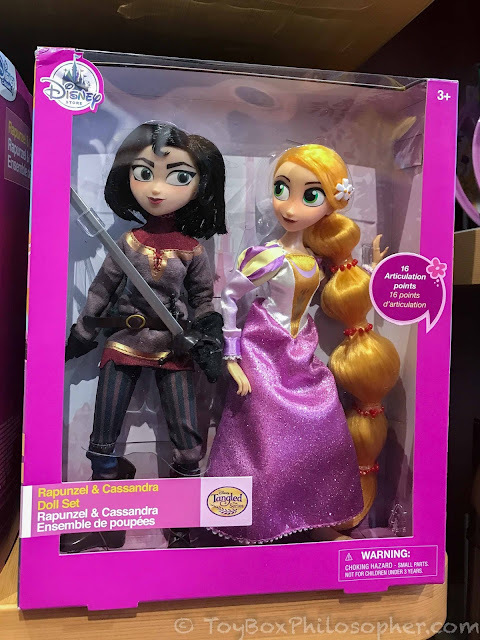 Hasbro and the Disney Store's Tangled: The Series Rapunzel dolls. 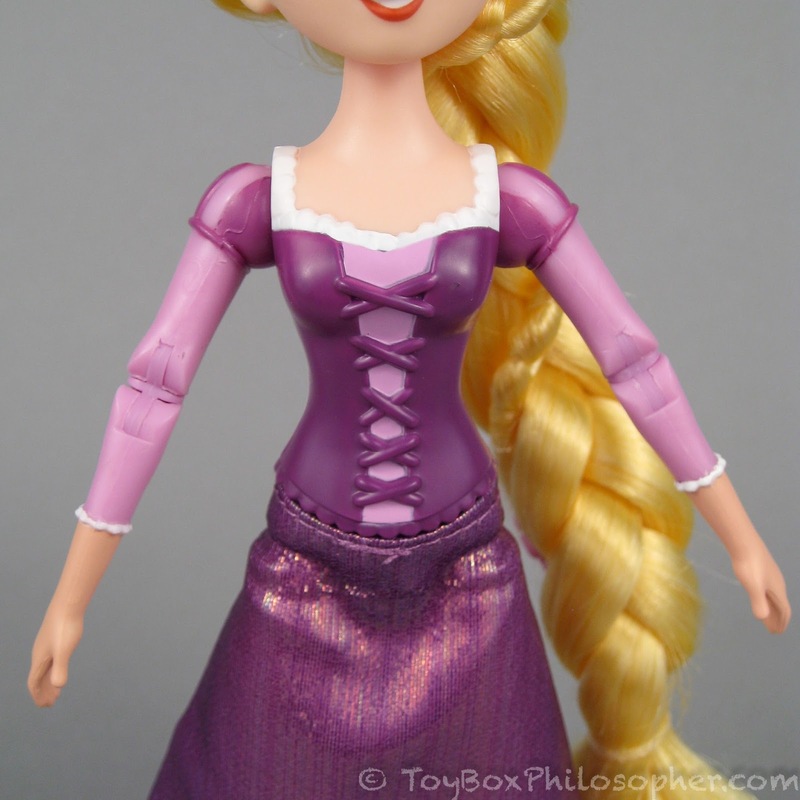 The Hasbro doll is 8-inches tall, which is about 2.5 inches shorter than the Disney Store doll. 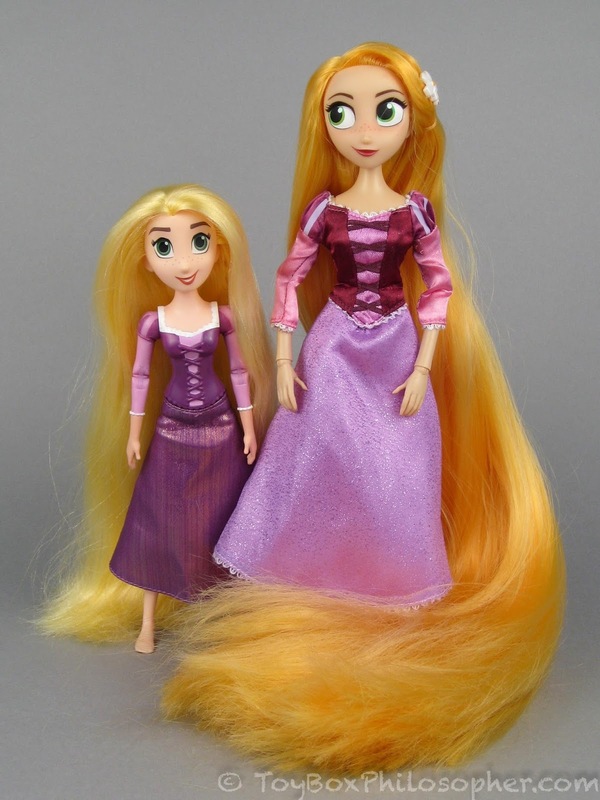 These dolls are both nice options for fans of the television series. 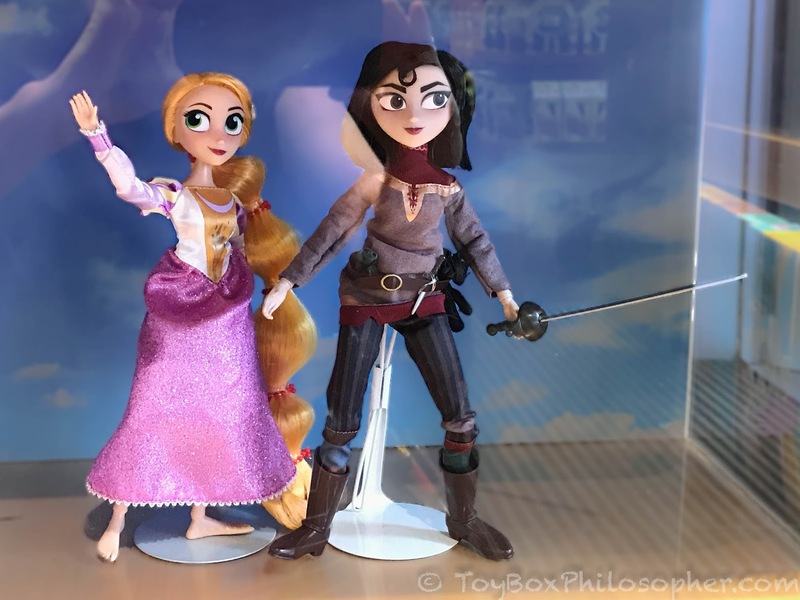 I wish that the larger doll had the same elbow articulation as the smaller doll, and I wish that the smaller doll had a better skirt design. 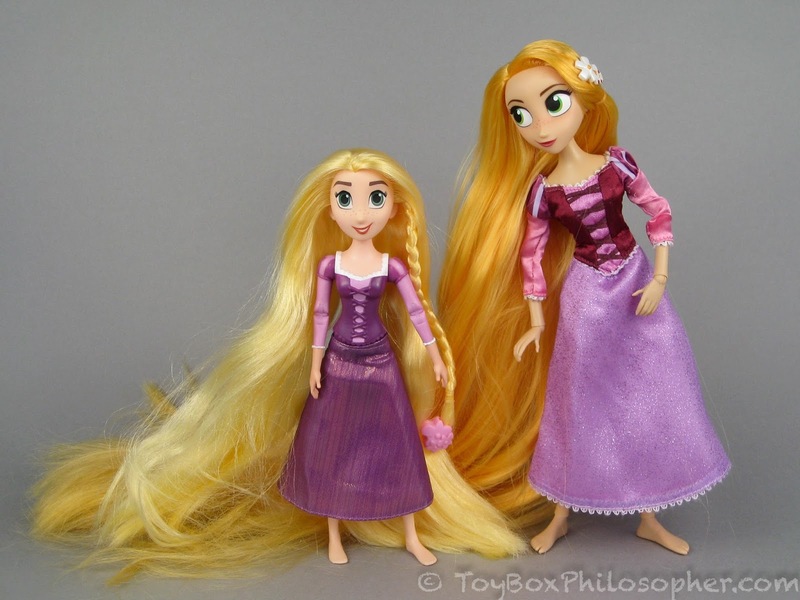 I wish both dolls could stand up on their own a little better. 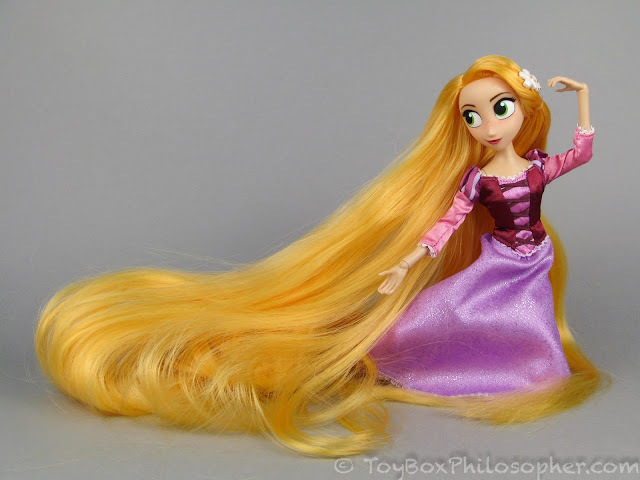 The Hasbro doll has wonderful, soft hair that would be a good choice for kids...but it's hard for me to resist the extravagance of the Disney Store doll's super-long hair, no matter how impractical and tangle-prone it is. 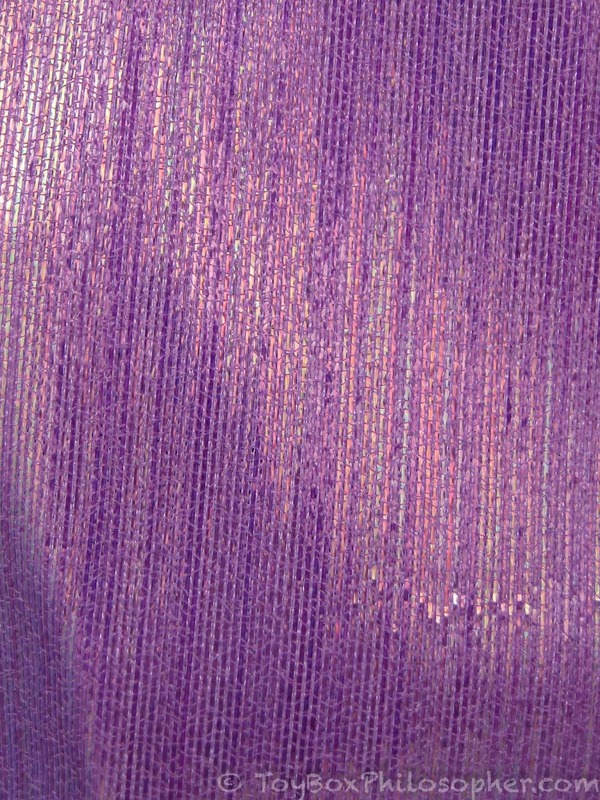 It still looks fine at the top (a little stringy, maybe), but it's starting to get tangled and clumpy towards the ends. 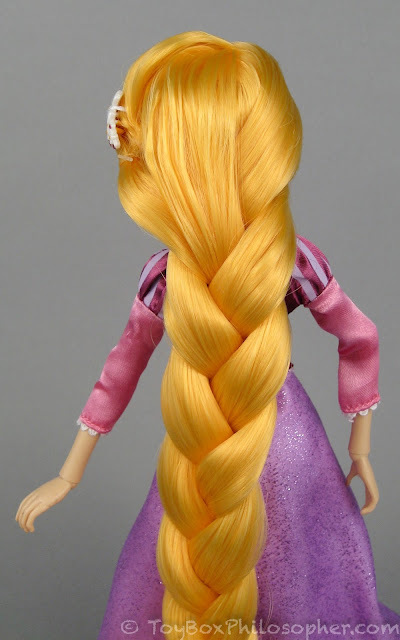 As long as there's a sturdy brush on hand, though, it's really fun to play with this hair! Bottom line? 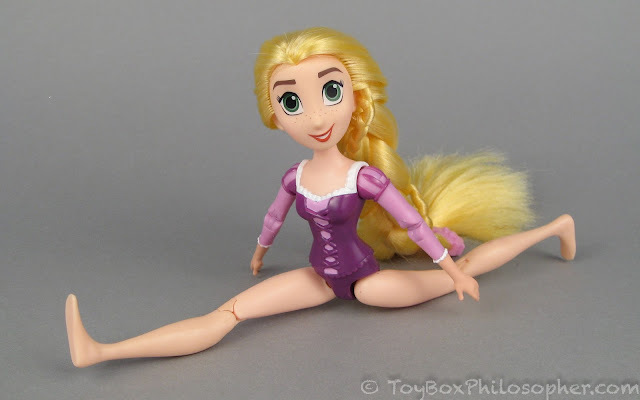 I've been hoping that the Disney Store dolls would get upgraded knee joints for a long time now. 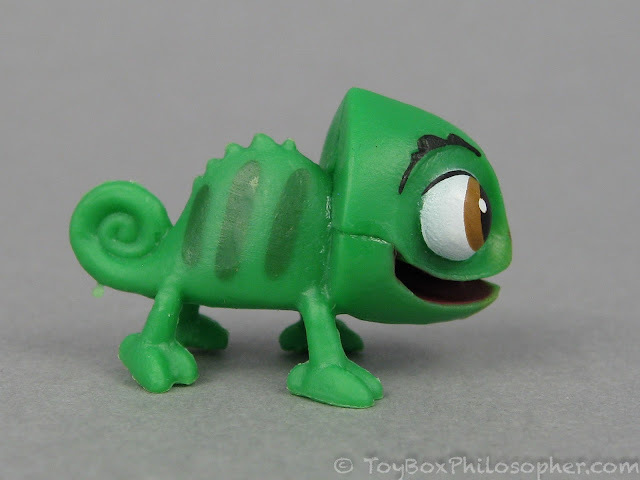 The unsightly, fragile joints that Disney has been rolling out year after year have become a elephant in the room for me. 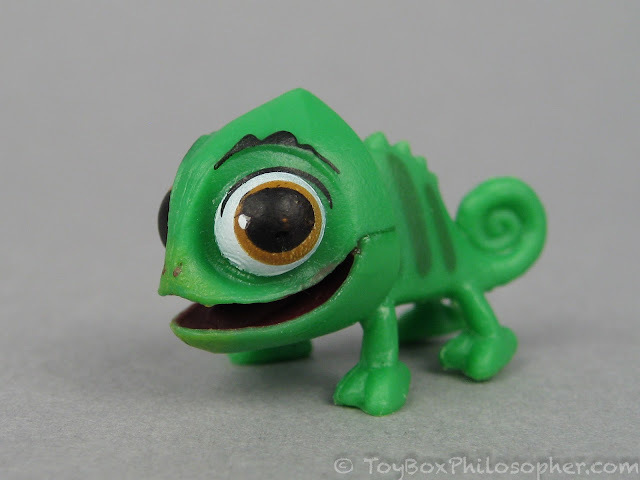 I can no longer see past this flaw to enjoy the colorful lineup of beloved characters. 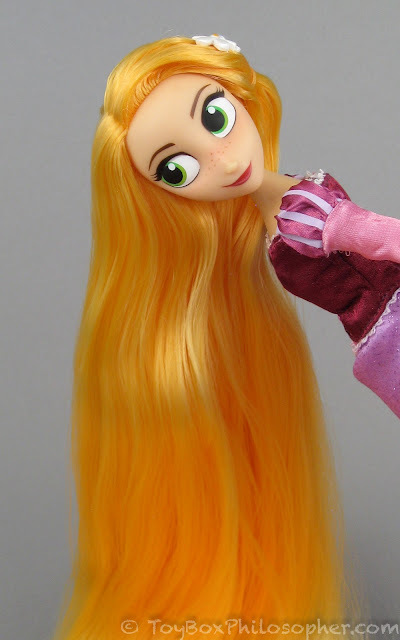 However, with this new Rapunzel doll, Disney has given me a break. 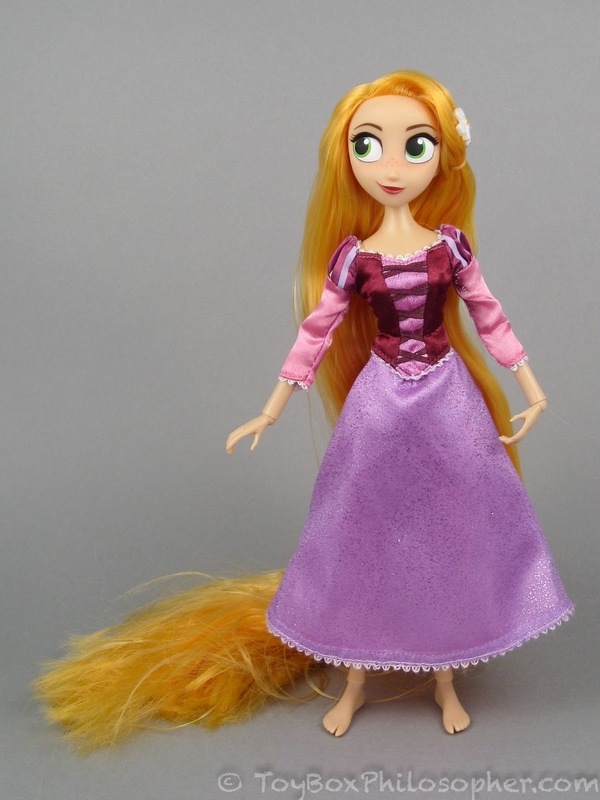 Rapunzel has newly designed knee joints...and they're great. 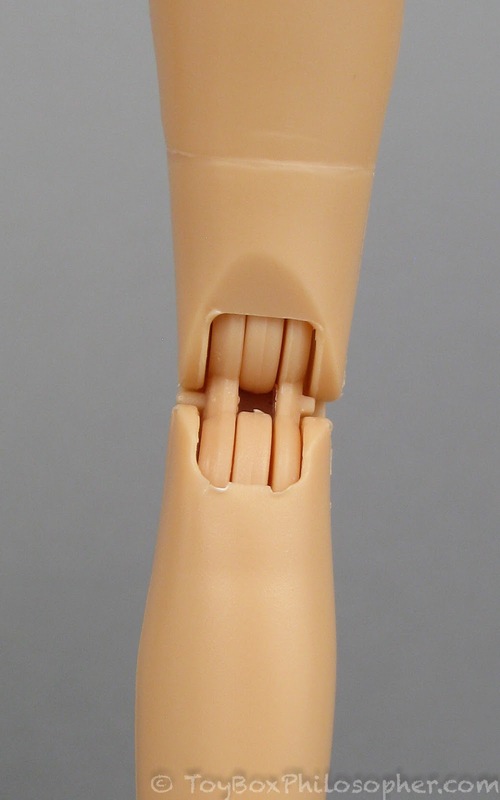 In fact, the new leg design is very similar to that of the Liv dolls, who set the standard for play doll articulation back in 2012. But I'd be romanticizing the situation if I tried to pretend that the new knee joints make this Rapunzel a perfect play doll. In fact, the knee joints themselves fail to live up to the current standard for play doll articulation: Mattel's Made to Move Barbie dolls. This is mostly because there's no rotation in the knees, and no rotation in the thigh to compensate. 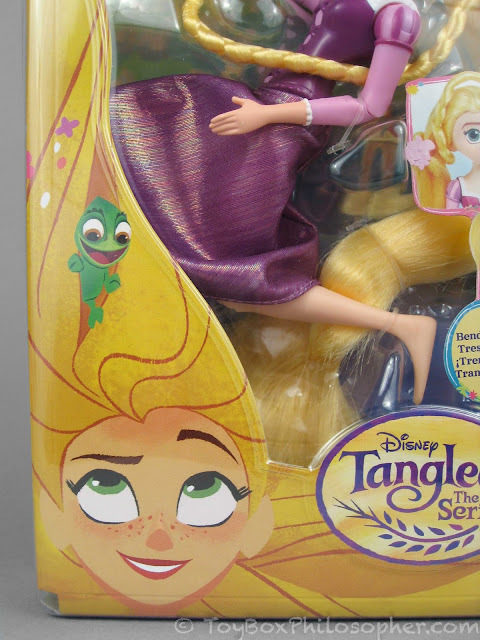 There are some other flaws with this doll, too. 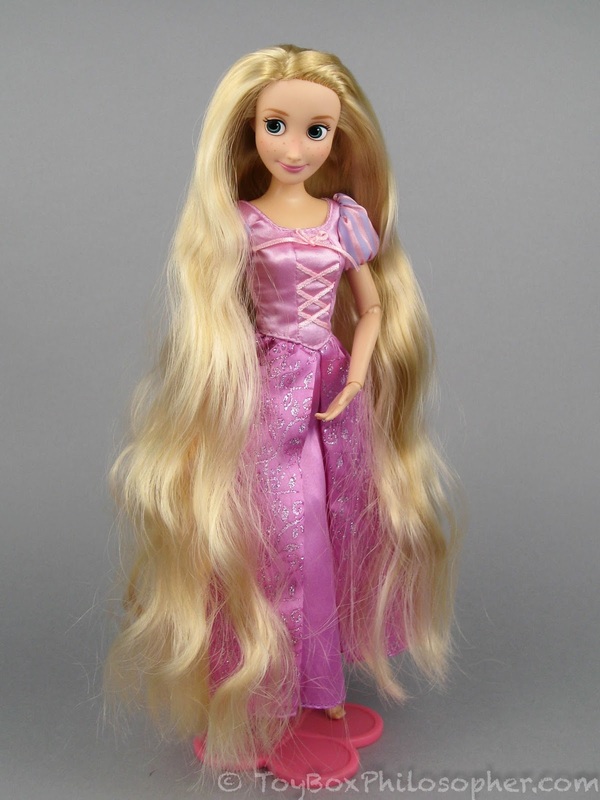 Most notably, her hair is too long and tangle-prone for a play doll. The coarse, frizzy ends of the hair aren't even ideal for display. 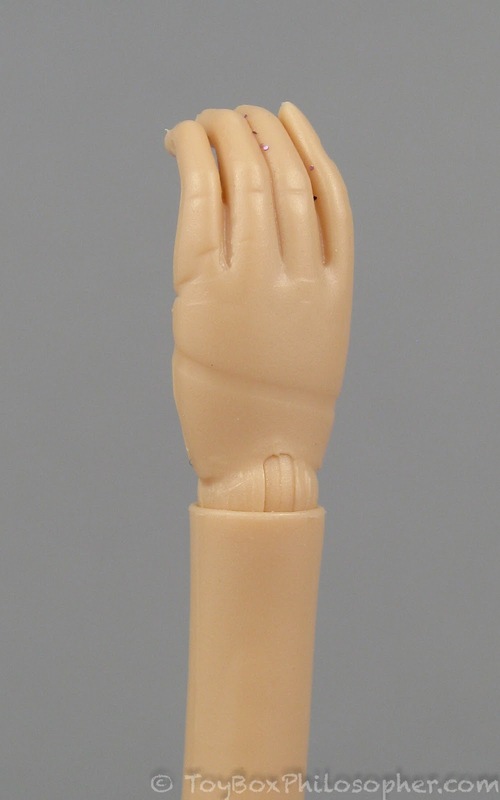 Also, I think the new body mold has underperforming arm articulation and unattractive hands--with claw-like thumbs and an assortment of molding defects. 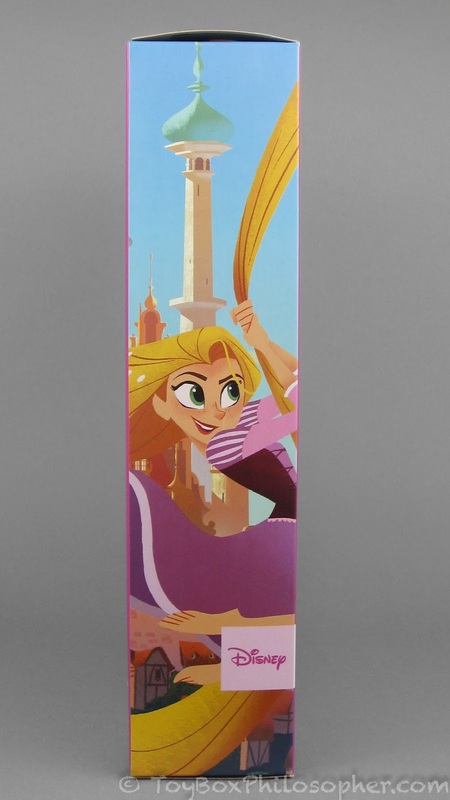 The last main flaw is that Rapunzel does not balance well on her own. 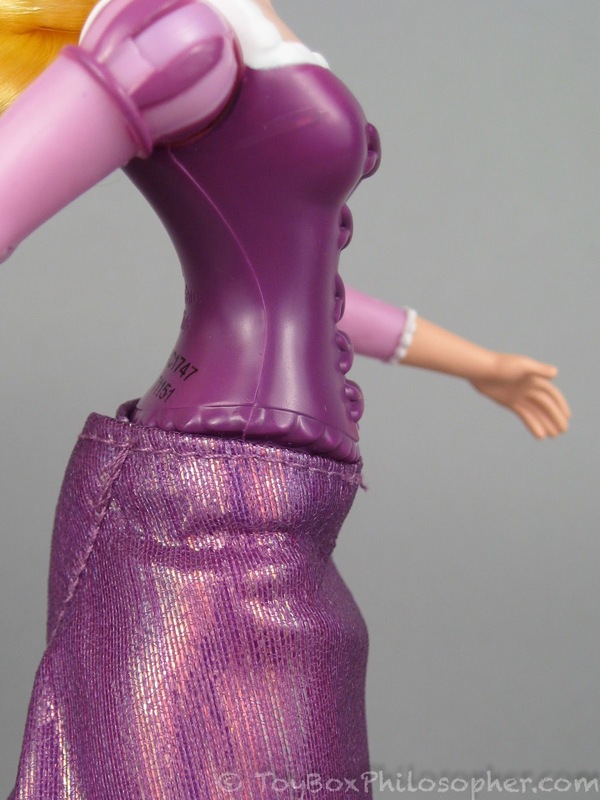 Her hips have some vertical movement, which is realistic, but allows the legs to become uneven. 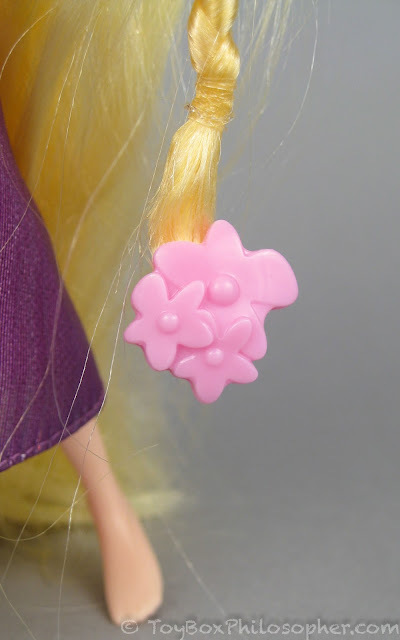 Also, even though Rapunzel has large feet, the surfaces of the feet don't root her to the ground very well. 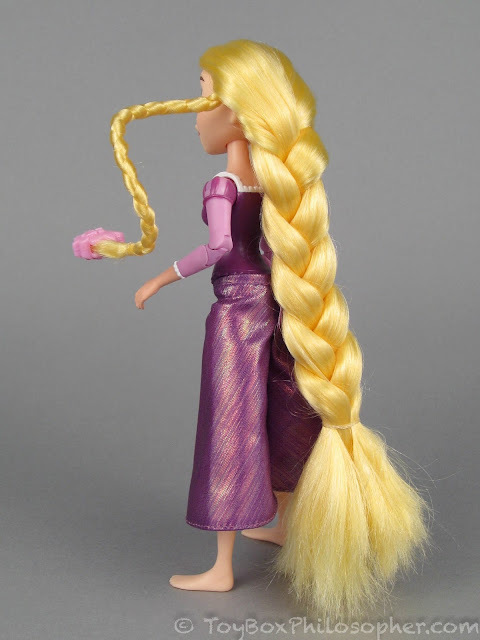 Last, those new knee joints buckle quite easily, making Rapunzel prone to a backwards tumble--especially with the added weight of her hair. 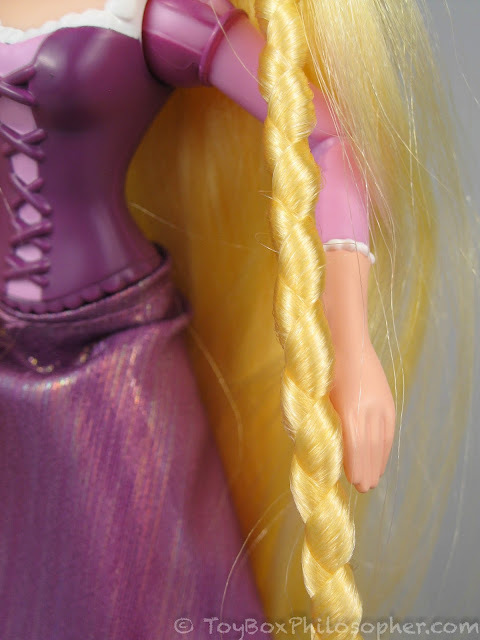 There are a few other small problems with my Rapunzel--like her mismatched pupils and her unraveling dress seams--but these are incidental and to be expected from most play doll lines. 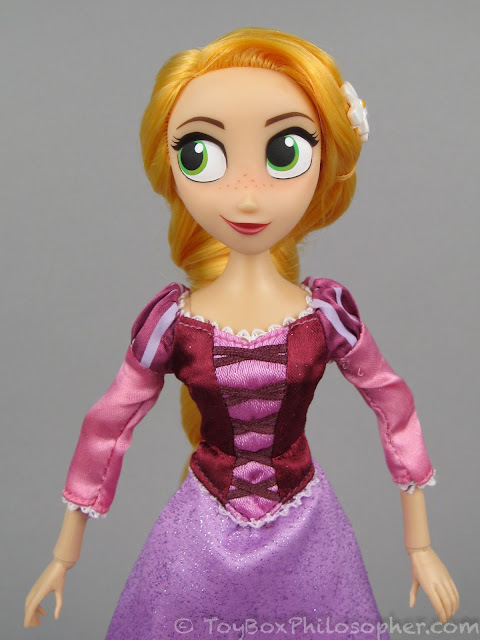 With those issues out of the way, I can admit that I really like this doll. The bright playfulness in her expression is hard to resist. She has huge eyes and exaggerated features that manage to remind me not just of the Tangled: The Series character, but of the original Tangled Rapunzel. 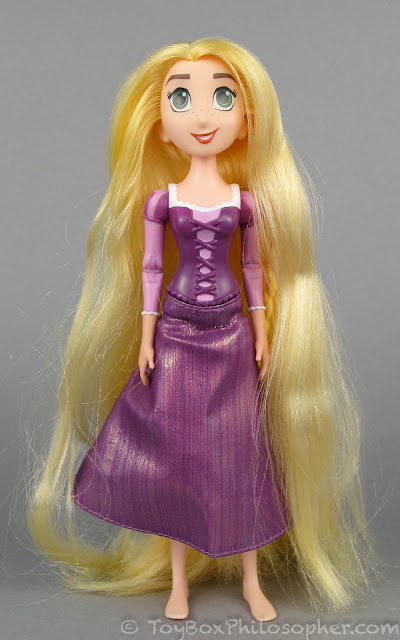 In fact, I think this doll conjures the 2010 movie heroine's personality more than any of the Classic Princess versions have. 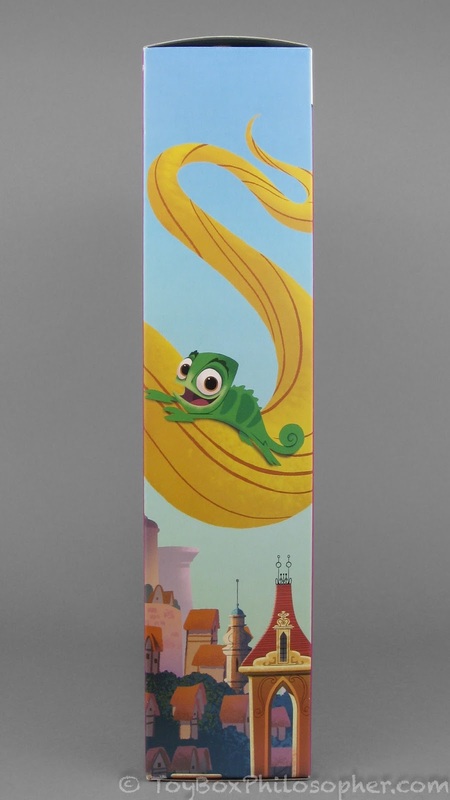 As for the new body design, it might have some flaws, but overall it's a big leap forward for the Disney Store. 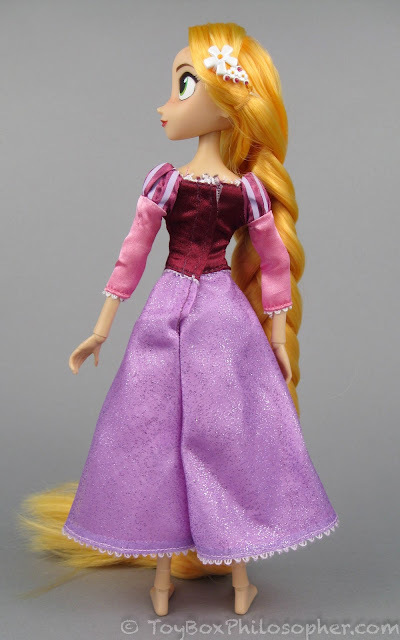 The knees look great and have wonderful movement, and the extra torso joint is very fun. 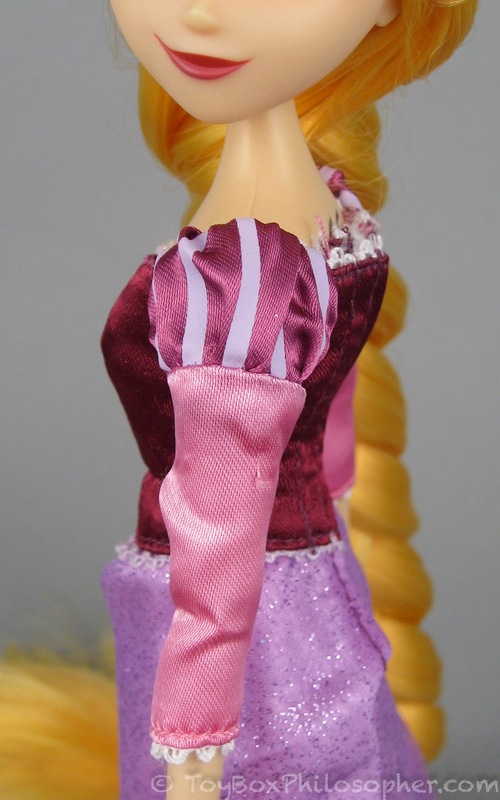 I also love how this doll's head moves. 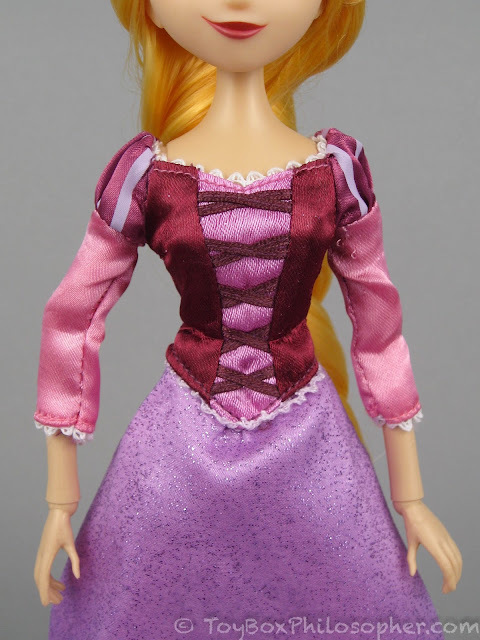 Her outstanding neck joint--coupled with those side-glancing eyes--allows for some wonderfully expressive poses. Even Rapunzel's unruly hair makes me happy. 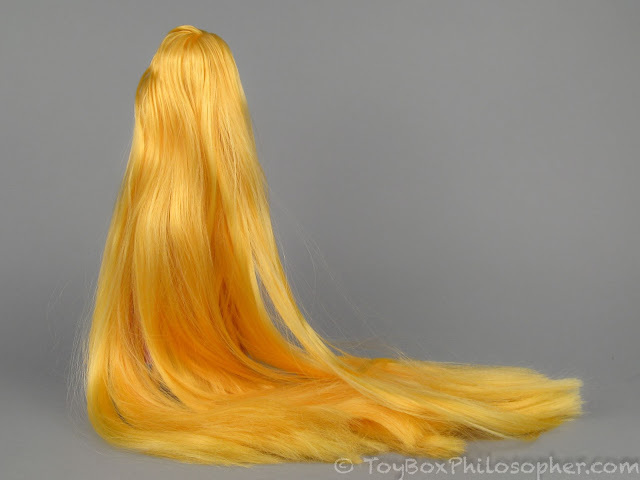 It requires constant attention, but the bright color and ridiculous length make it special. Intentionally or not, the hair maintenance required for this doll makes me sympathetic to what life must be like for Rapunzel as she grapples with her extraordinary hair. 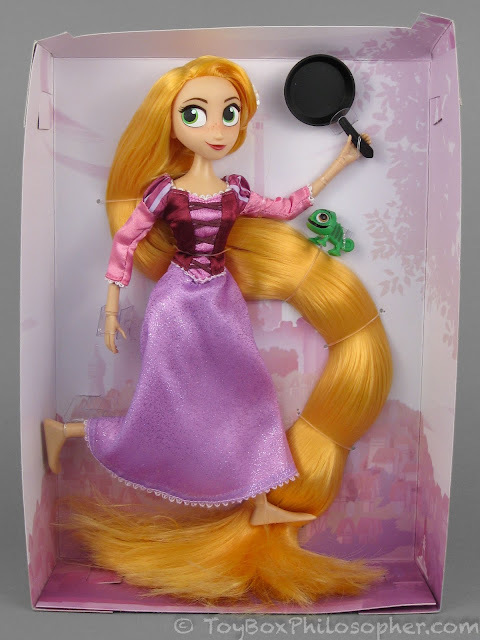 Perhaps the biggest endorsement I can offer is that I want this Rapunzel's body to be the new norm for Disney Store dolls...with a different hand and foot mold. 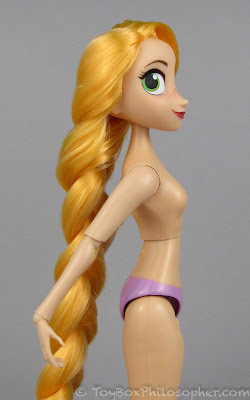 Unfortunately, at this stage, only two Tangled: The Series characters have this body. The entire 2017 Classic Princess lineup has been cursed with flat-footed rubbery legs. The whole situation feels like one step forward and two steps back, but maybe--just maybe--Rapunzel's new articulation is the test-run for some great changes on the horizon for the Disney Store dolls. I hope so. 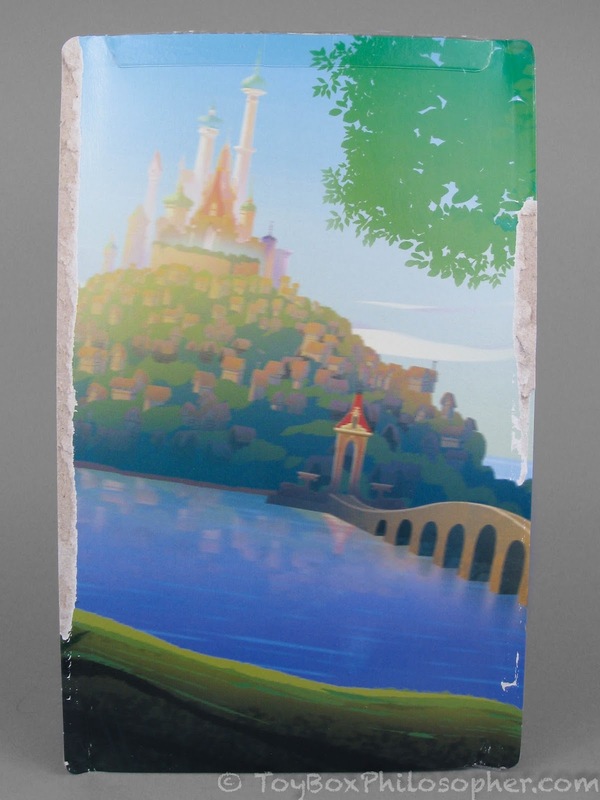 Arendelle? I think you've mixed up your princesses, but it's fine! The second doll is just...not appealing at all, to say the least. Looks like a funny photoshop. 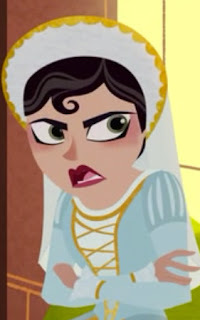 And Cassandra reminds me of Duchess from EAH! Not only did I not know there was a DS exclusive T:TS Rapunzel, I think this is the first playline doll i've ever seen actually take a kneeling position with one knee on the ground and the other at an angle. The Disney one definitely looks better than the Hasbro one. 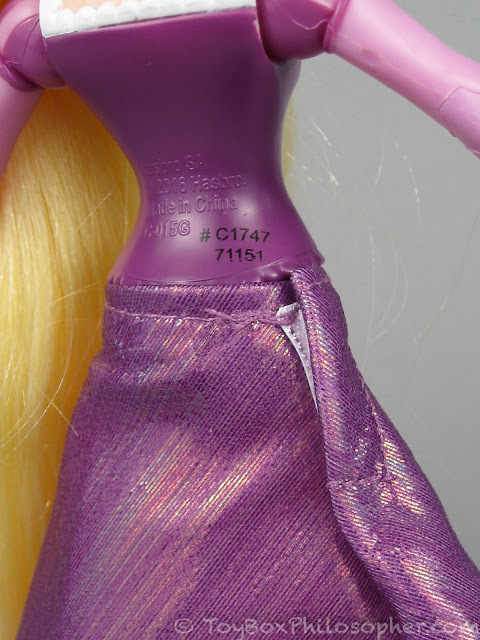 I wish companies would just stop with the molded on, painted on clothing. We've been debating Tangled the series at our house. (We've not seen it though) If it was before she got out of the tower - it'd be fairly dull. But if it's after (and as you said it is) Why does she still have the long hair? 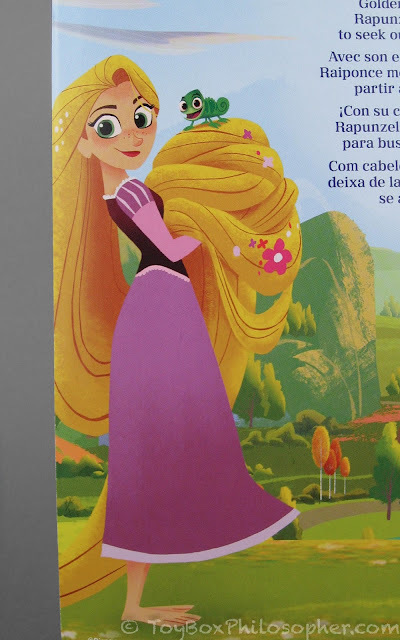 That's the mystery they'll need to solve in the series, her hair grew back after Cassandra brought her to the place where the flower was found(now a monument), where they were chased by magical glowing spikes. 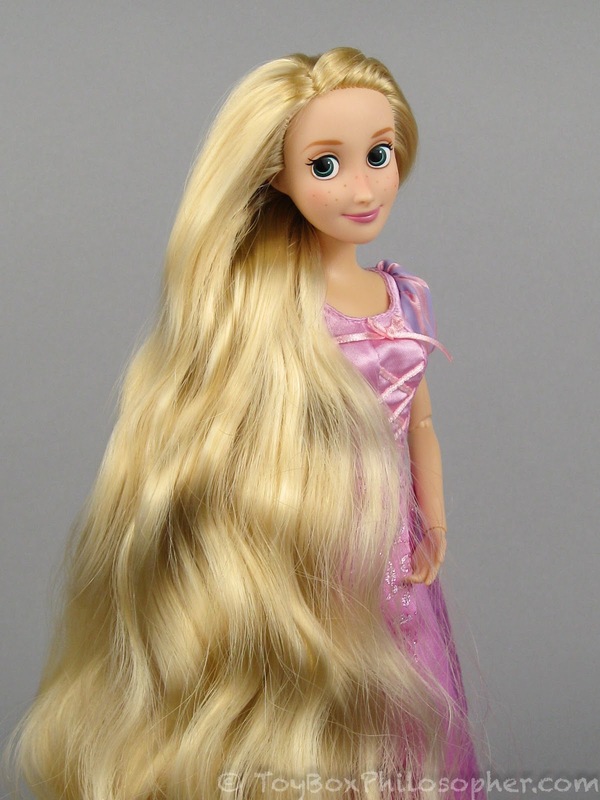 Her current hair lost their healing ability and gained invincibility. The Toys R Us stores here have clearanced some Journey Girl stuff, but have never gotten rid of them. I like JG, so I'm glad, but the prices! Ouch! 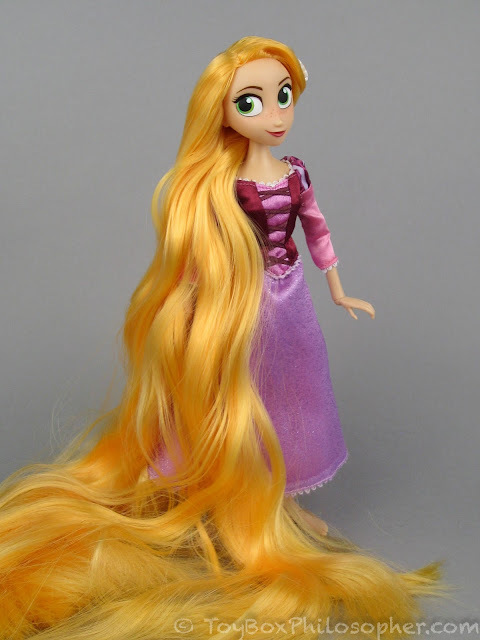 I'm now debating whether or not I want a new Rapunzel. 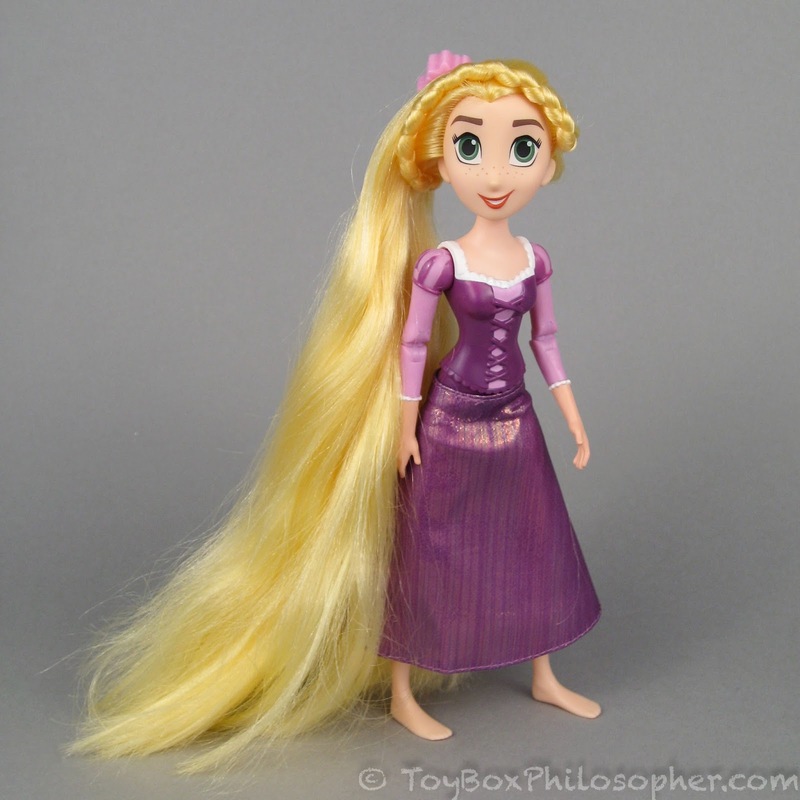 I've got an older one (Pre-2017 Disney Princess Classic; I think I got mine back in 2015) whose hair is--as you mentioned--absolutely gorgeous and wonderful to touch and play with. 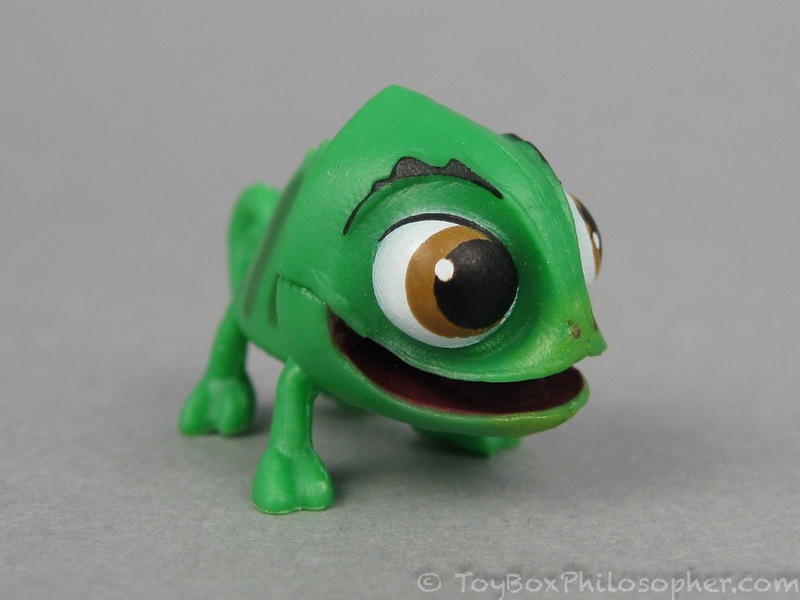 However, the new one seems so cute and spunky. Maybe there's room for BOTH of them on my shelf? I saw these Rapunzel dolls in the Disney Stores around here a while back, and never really got into it. I'm mostly a Monster High (or any creepy doll) collector, and I left Disney aside when I realized the dolls don't stand out to me that much. 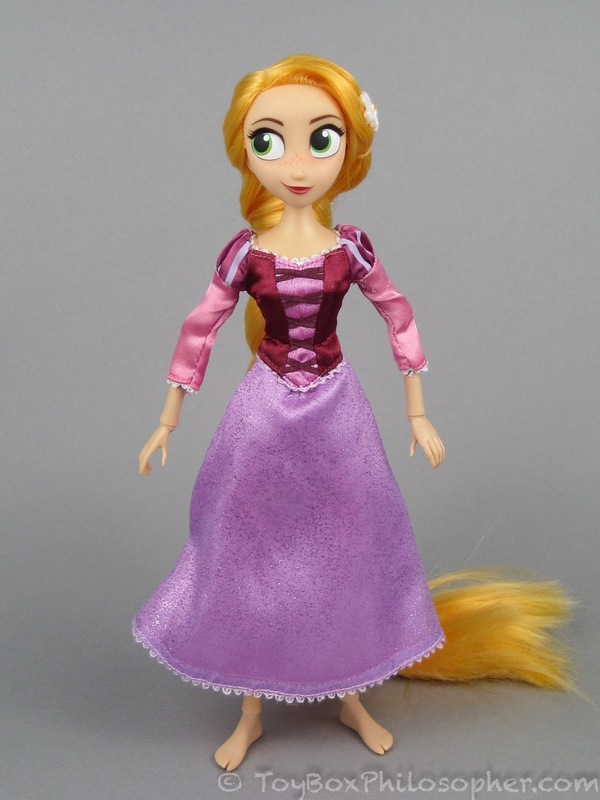 However, I may re-think the possibility of getting this new Rapunzel, specially after your review. 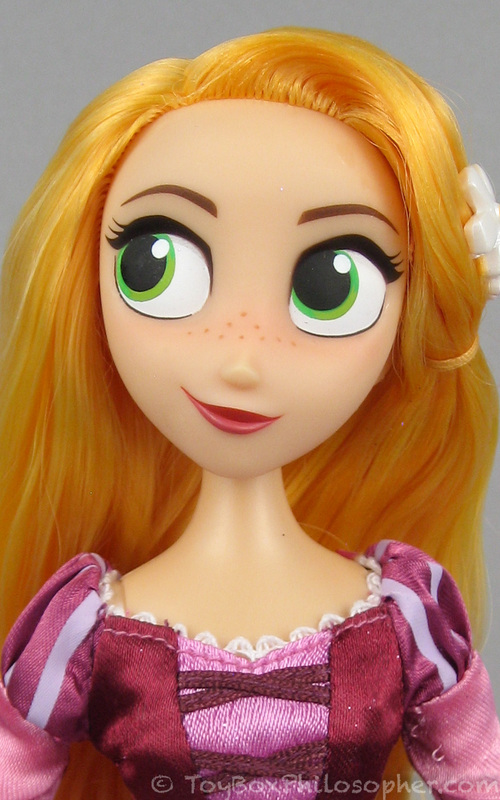 Ach, you always make me want the dolls you review! 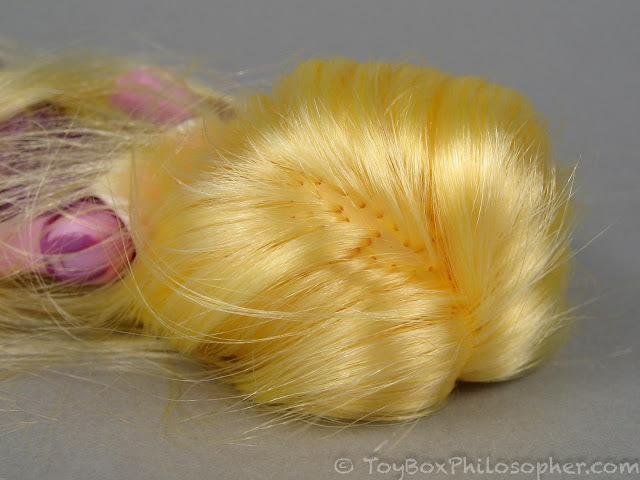 Ok, I got the doll in the end, the DS one, and...wow. 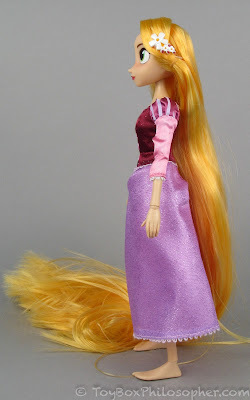 Is one of those dolls that you hav to "see to believe". THE HAIR! 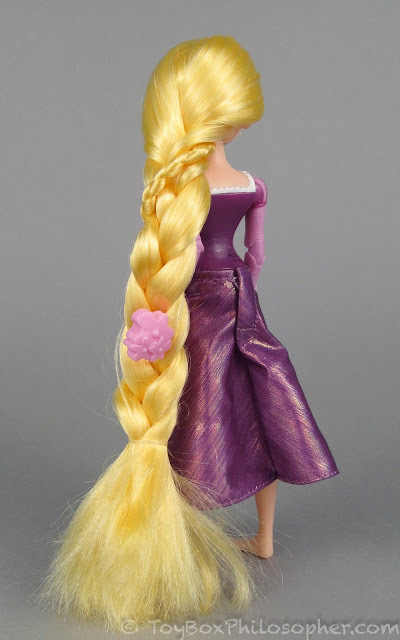 That is a Gooliope long hair! 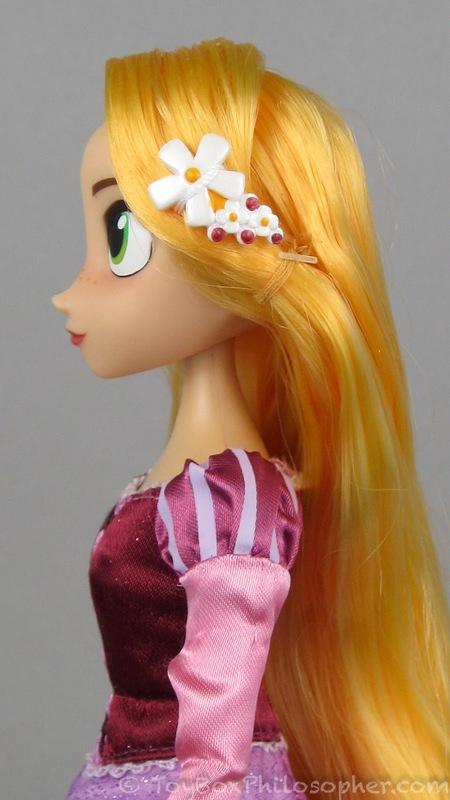 In fact, I put Rapunzel's hair next to my Gooliope and were the exact same lenght! I wasn't prepared for this. However, my doll came with a hip joint out of place (had to snap it back in its position), and while the hair didn't come as tangles as yours, I have to admit the arms articulations aren't exactly great. 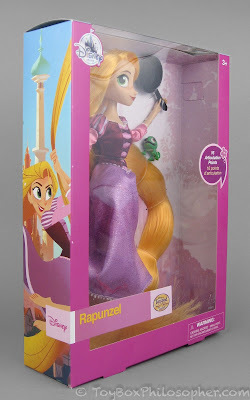 I've been looking towards buying a Rapunzel from this series but the disney store versions haven't appealed as much to me and I can't find a hasbro one I like yet. Hrm. 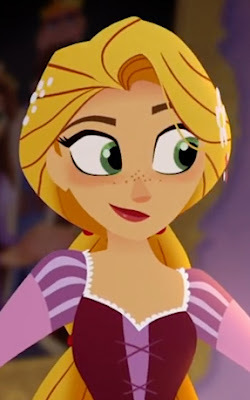 oh, and RE: Cassandra - she really is a sweetheart but Eugene/Finn and his antics (as well as his extensive criminal past) have her wary of him. Once we spend more time with her & Rapunzel over the first season you can see why they're friends and more sides of her personality. 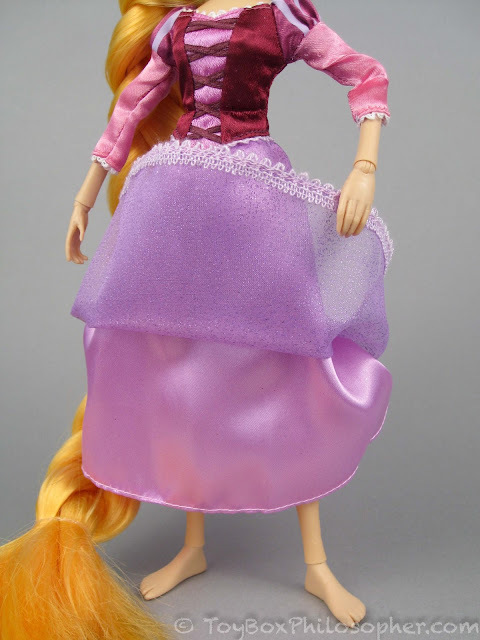 Wow im so happy more dolls are starting to get the double knees! They are taking advice from the great success of the made to move. 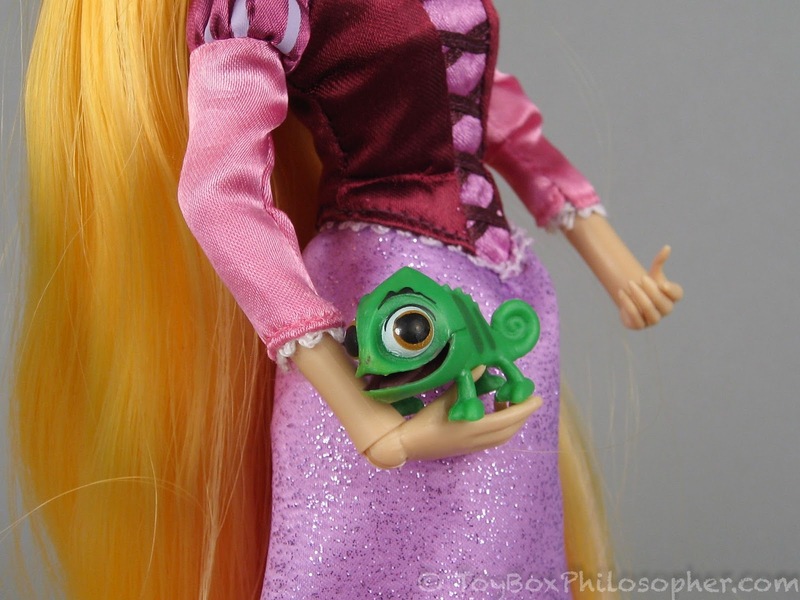 Monster high needs to doo this too. Actually i have noticed something sad in my stores. The monster high doll once spanned a whole isle but are now in one tiny corner. And the sale bin is full of them. 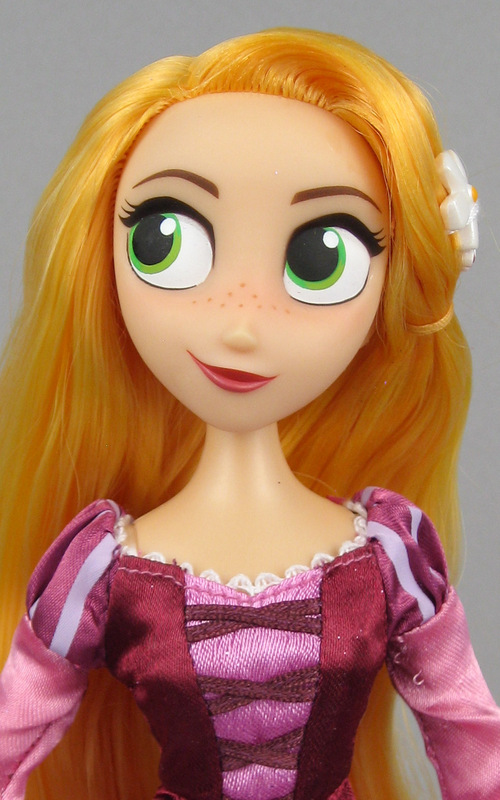 It sadly seems that they are destined to follow ever after high. I have a question for you emily. 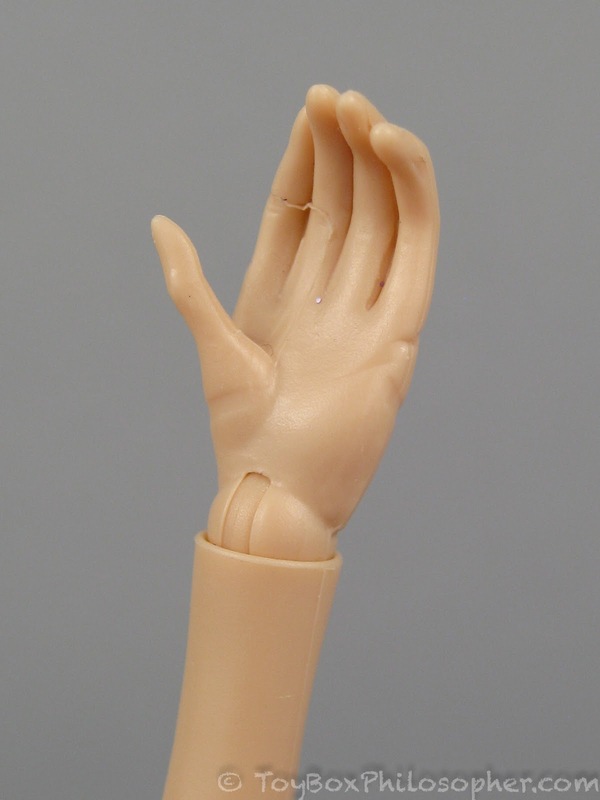 Are you ever going to review another azone pureneemo doll again? I loved your k on review. Thank you for the great reviews!! 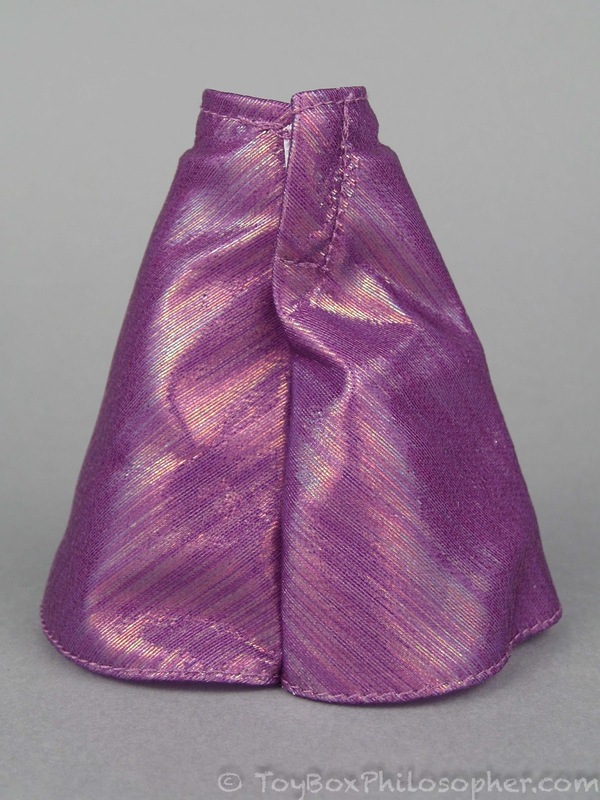 Journey Dolls are not discontinued. 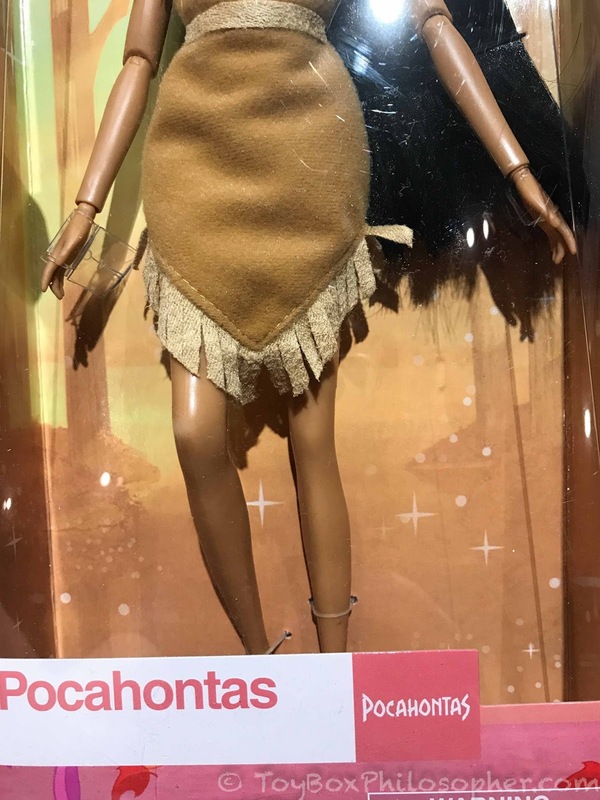 They are just not being sold in the stores that are selling American Girl dolls now. I'm guessing that AG must have had an anti-competition clause that prevents Toys R Us from selling both AG and Journey. However not all Toys R Us stores sell AG. 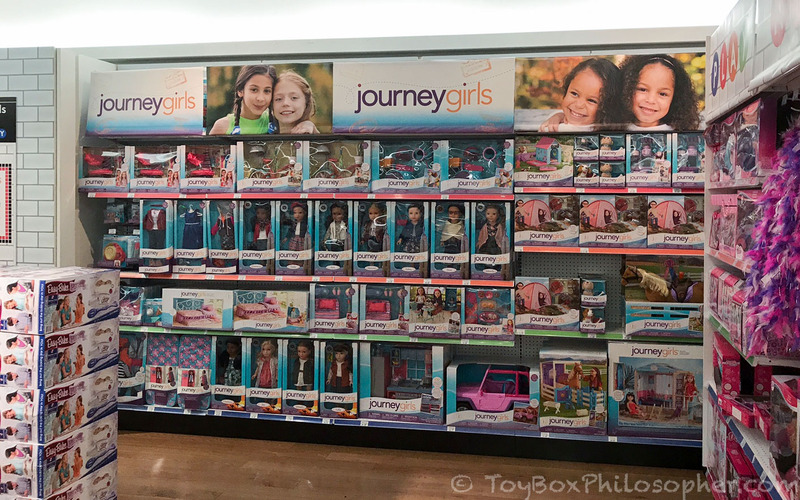 I'm assume that all of the stores that DON'T sell AG are still selling Journey Girls. 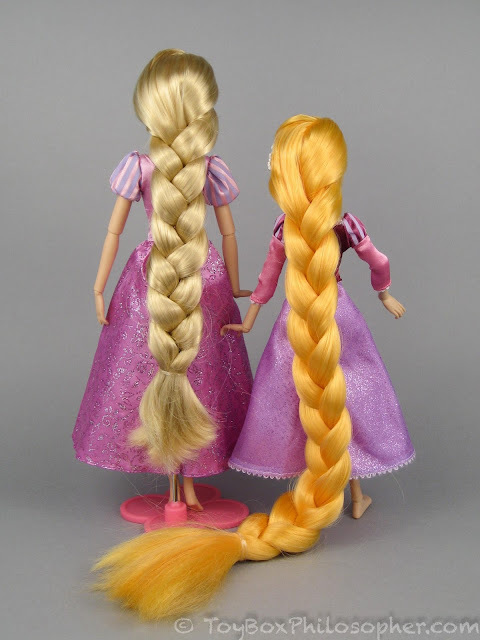 I love these little Rapunzel dolls. I think it's great they have so much articulation - even if it's not as good as Liv doll articulation. 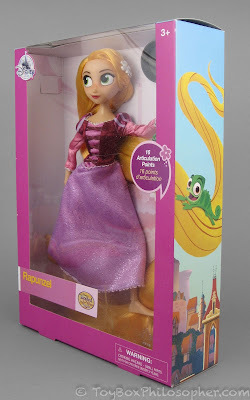 I keep looking at the little Rapunzel dolls everytime I go to the store - but I still haven't bought one yet. 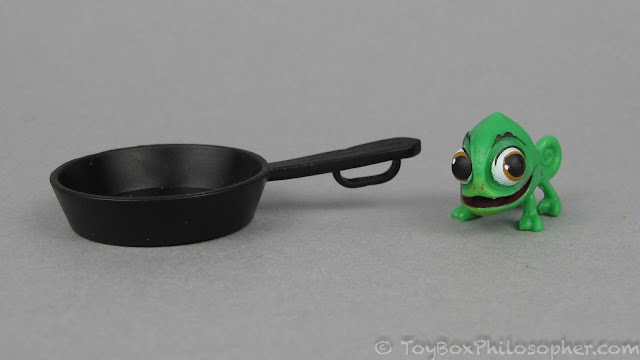 One of these days I will get one. Thanks for the reviews. 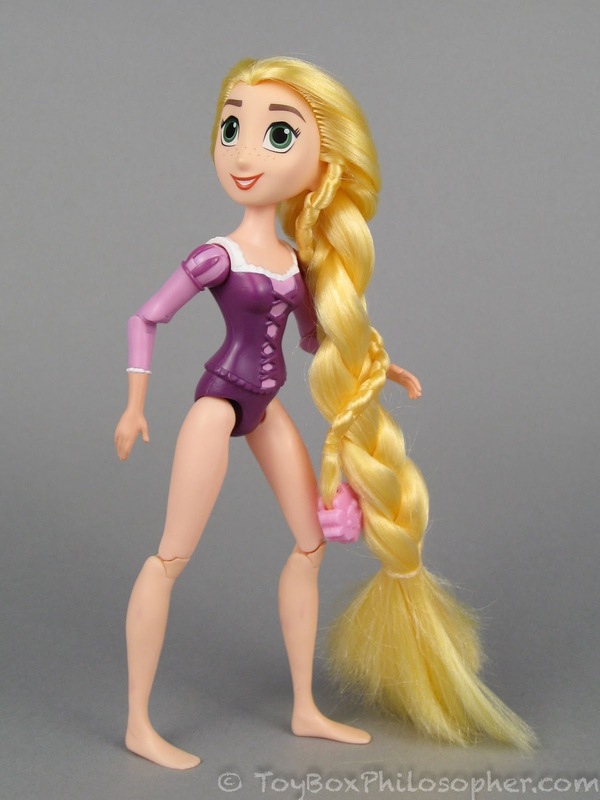 I do think this doll is cute but there's no way I'd buy a doll with unusual feet unless she comes with shoes. Making playscale shoes is far too much of a hassle. 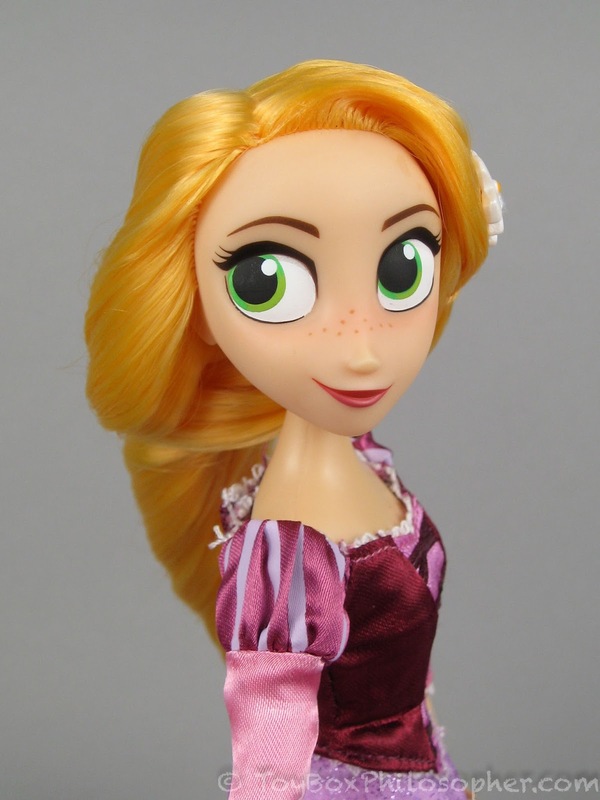 Quirky as her face is I like it better than the older Rapunzel's which seemed derpy to me. 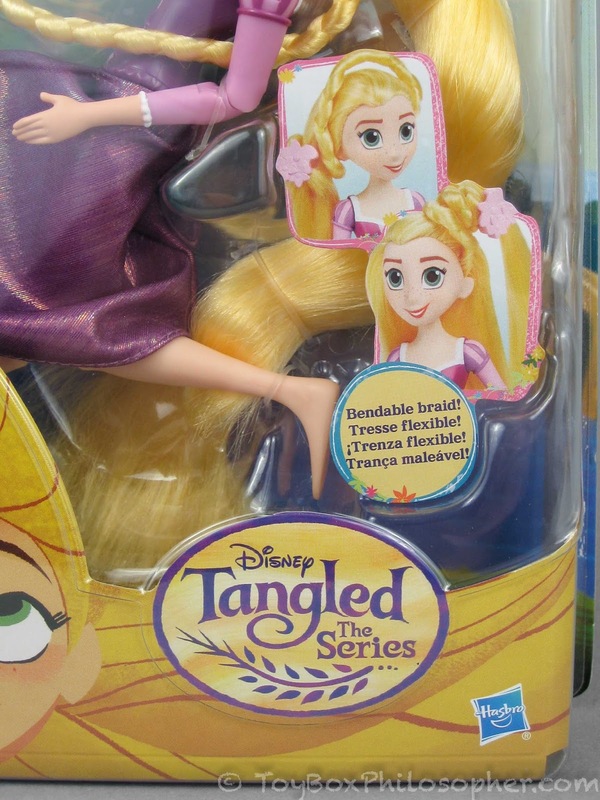 Those double-jointed elbows look really freaky, though. 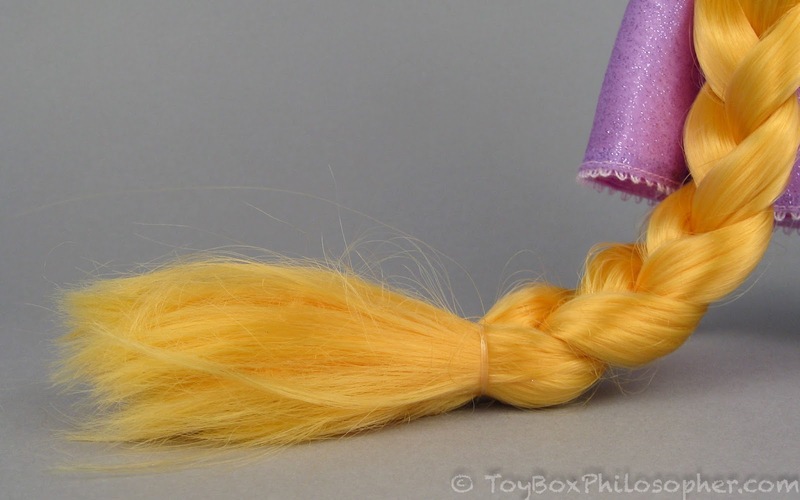 And the Hasbro doll's face looks squished. 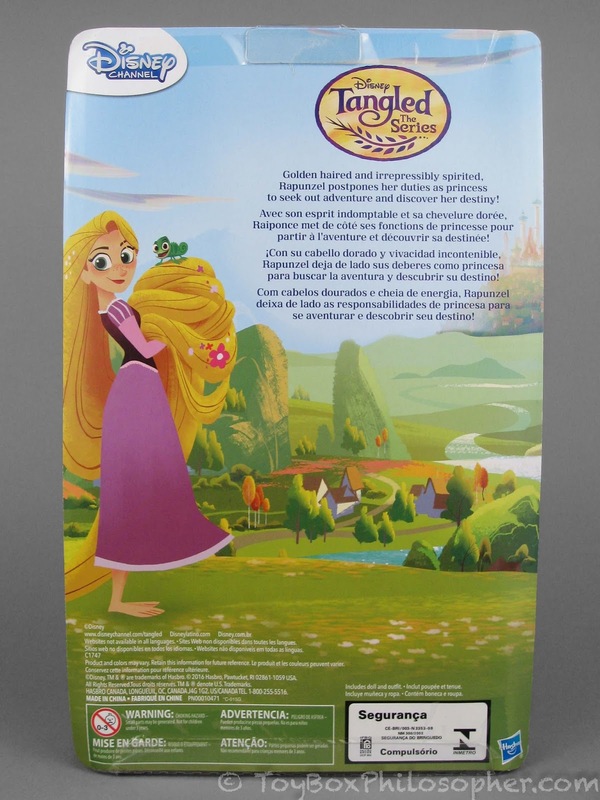 As for Journey Girls, I actually think their quality has been getting better, and I've managed to get a ton of them on great sales. I would be so upset if Toys R Us went under. 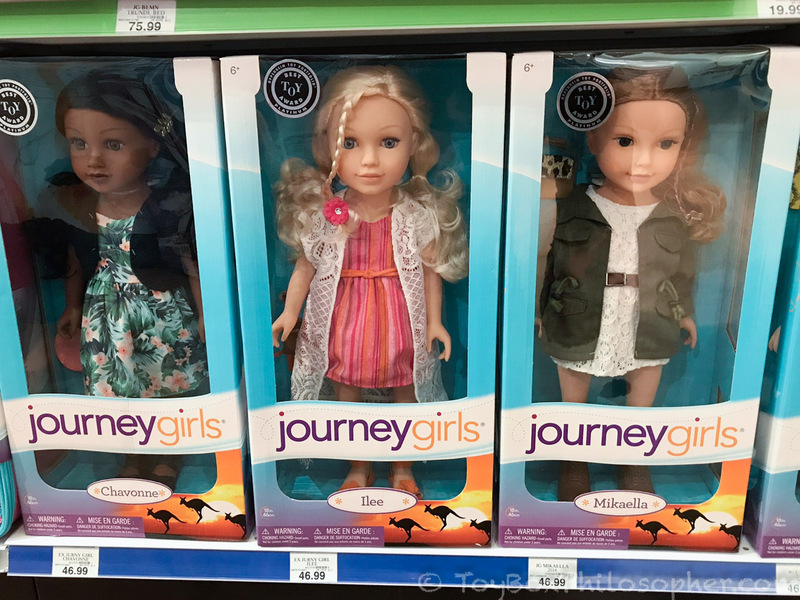 I think the Journey Girls have the most beautiful eyes of almost any play doll out there, and whoever designs the line has made some incredible dresses. They're a really great alternative to American Girl, whose falling quality and rising prices have pretty much turned me off to the brand. It'll be interesting to see what your Create-Your-Own doll turns out as. While I'm at it, allow me to reiterate that it would be wonderful to see some mini-reviews or just photos of the other dolls in your collection, especially your Karito Kids dolls. I'm just dying to know what else you have. Ah, you got her. Thanks for the review! 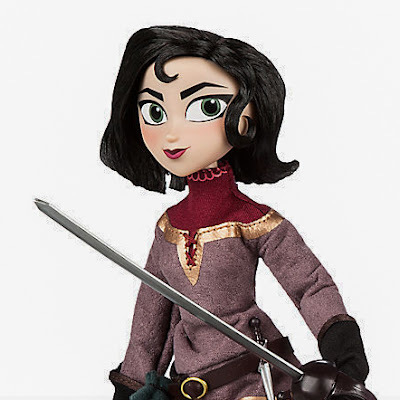 Visually I find her more appealing than I thought I would, and the body is a step up, but I'm disappointed to see the many slight lapses in quality and the articulation almost being great but not quite. I wonder what the future of the body will be. I hate Cassandra too, she's hoarding Rapunzel for herself. 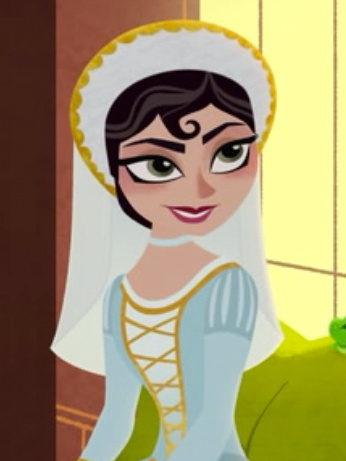 I won't be surprised if it turned out she's Gothel, or at least evil. Also, now might be a good time to look into pureneemo dolls again. 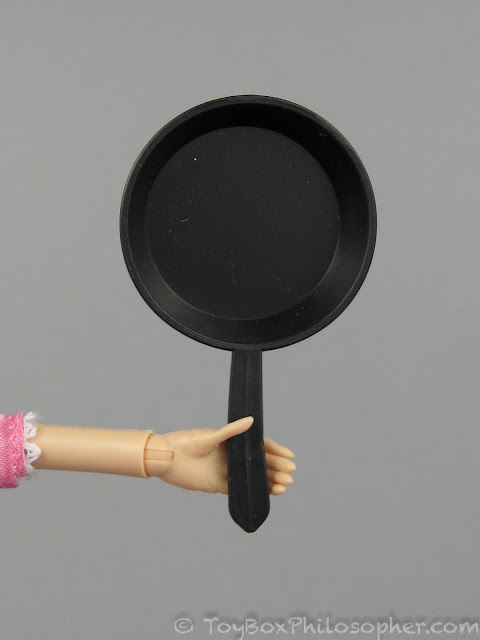 They debuted their new super articulated body for the current Ex-Cute girls line(only Lien has been up for preorder), it's back to basic this time around with the girls wearing their clothing brand with default eye & hair color. You can easily preorder them from AmiAmi, HobbySearch or HobbyLink Japan. You are right, this Rapunzel is way more Rapunzel-y than the 12" dolls! 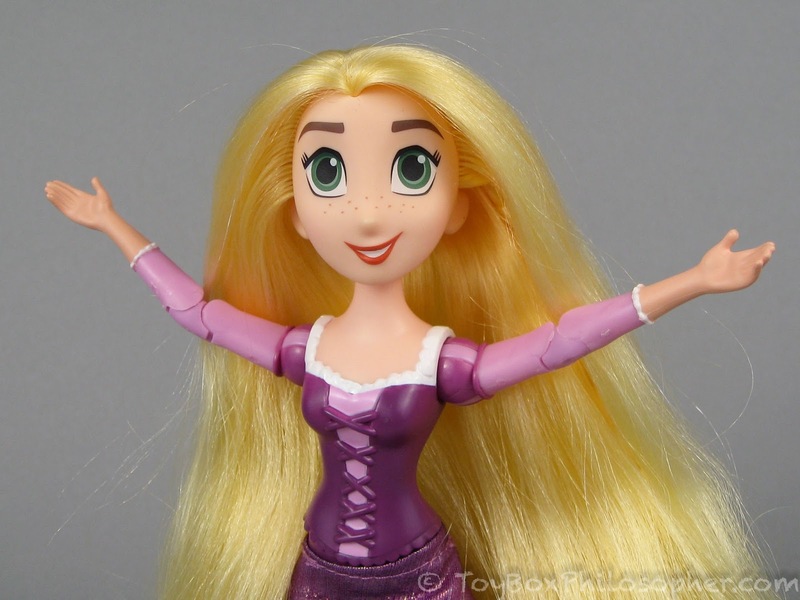 I saw the hasbro ones at target recently and it was hard to leave the 2 pack behind, I might have to get them soon since the joints are so nice plus I'm a sucker for a good articulated boy doll/figure <3 Your comparisons have helped me make decisions on many toys. 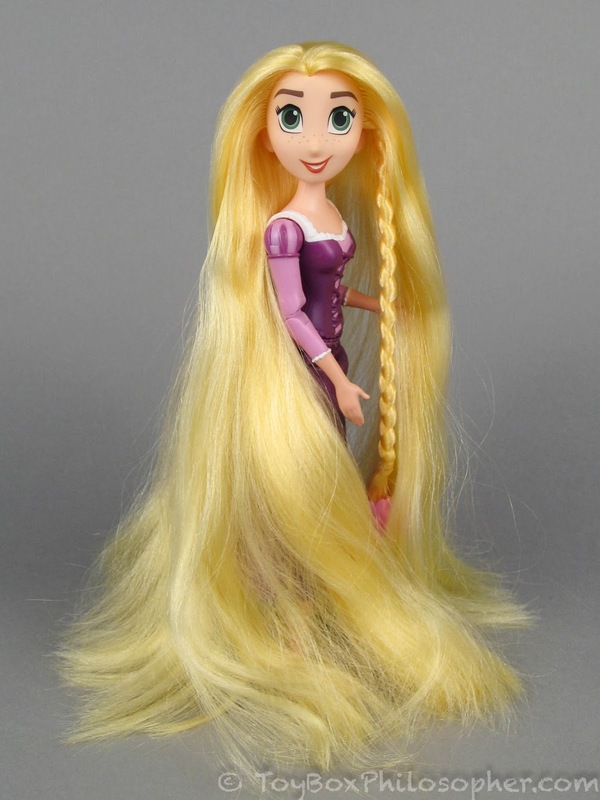 I don't really find the tangled cartoon dolls appealing, but the DS version does have some really pretty hair! 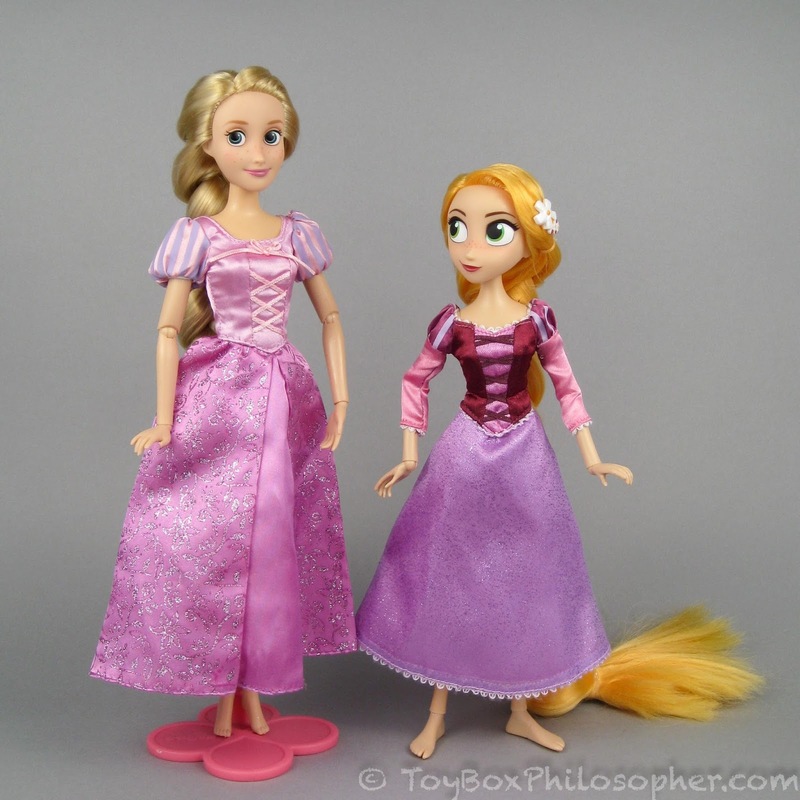 I kinda love that she is actually shorter than the normal classic dolls. And can I just say, thank goodness for new knee joints from DS? I mean, finally!! 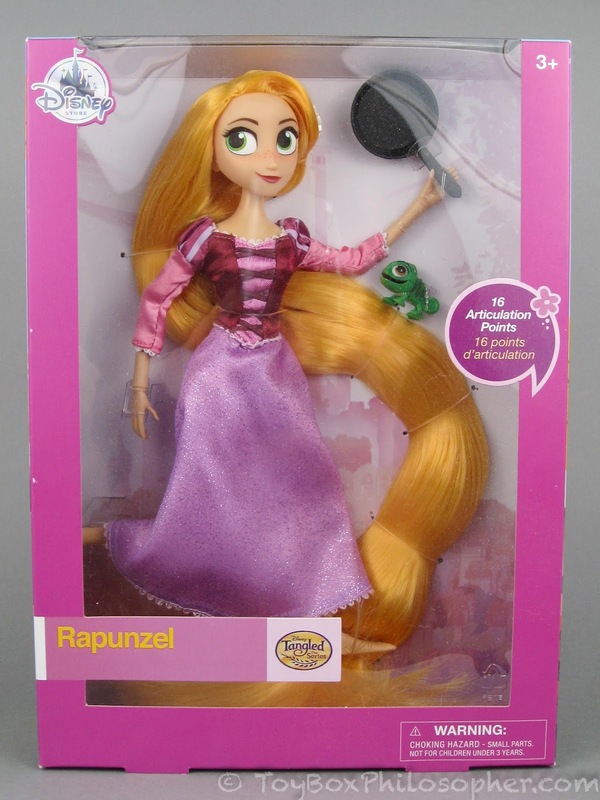 I could totally get on board with the classic dolls eventually being like this rapunzel doll. It would be kinda cool actually! It's me, Meiyin. You might remember me from a few years ago! 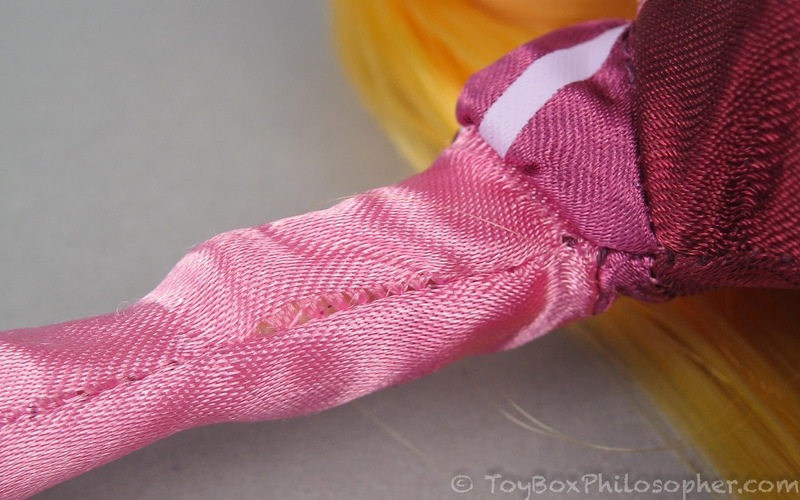 It's been a while since I read the blog, or since I have been active with dolls lately. 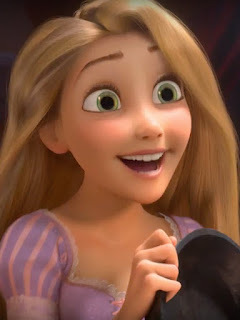 I suddenly thought about your blog and I still enjoy reading your reviews a lot. ^^ I like it how detailed you are with the reviews. 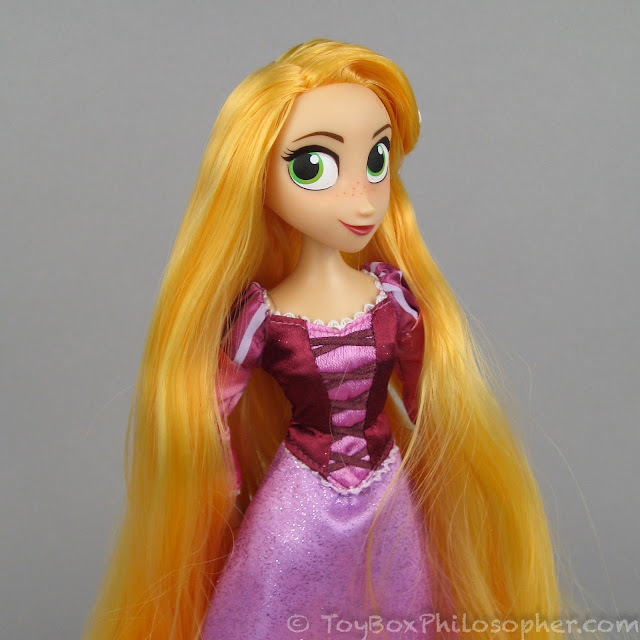 The Disney Store Rapunzel looks absolutely adorable and so much better than the Hasbro one. 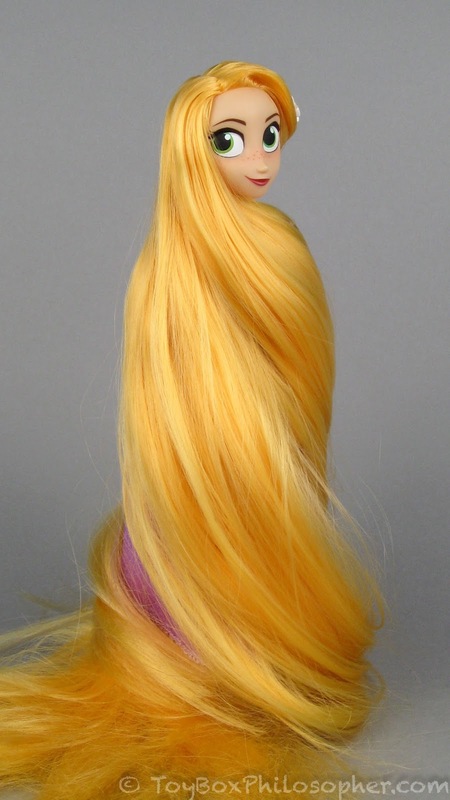 I like how long her hair is and the color is nice too. 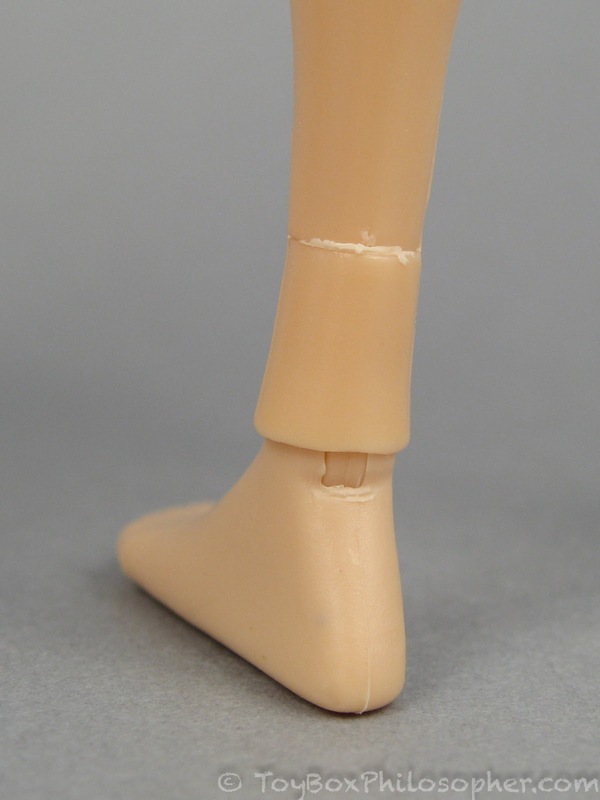 The double-jointed knees are great and I am so happy that more and more dolls are starting to have them. Thank you for the review!